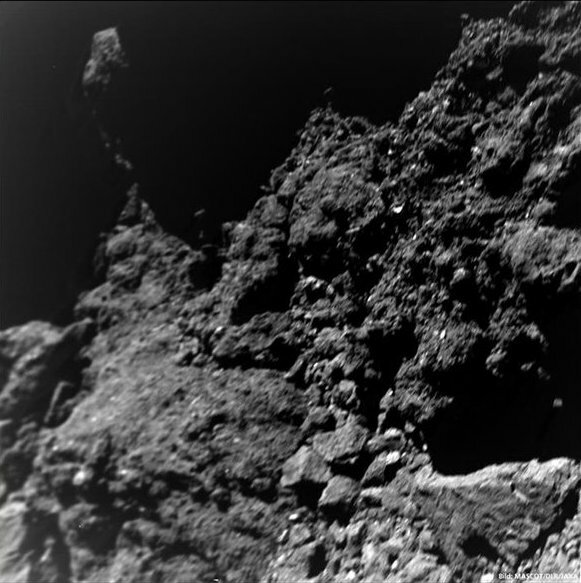 In 2014 I have published several posts about Rosetta, the spacecraft that has explored the comet 67P. Click here for my reports. 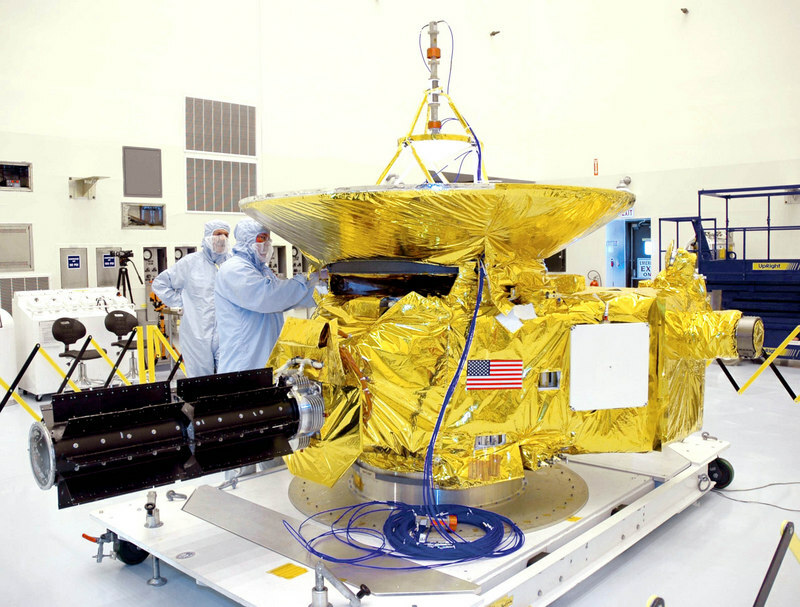 I am very interested in these Close Encounters between spacecraft and celestial bodies. Here is a new one, the Japanese Hayabusa mission. Actually there are two Hayabusa spacecrafts, the first one was launched in 2003, the second one in 2014. 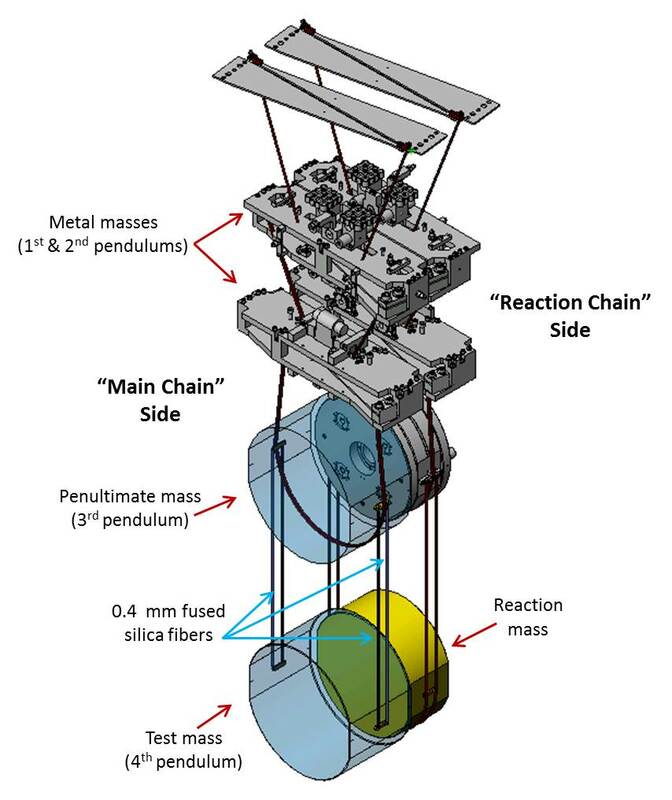 Their mission was basically the same: Fly to an asteroid, land on it, collect some asteroid material, then fly back to Earth to deliver the collected material. An ambitious project! 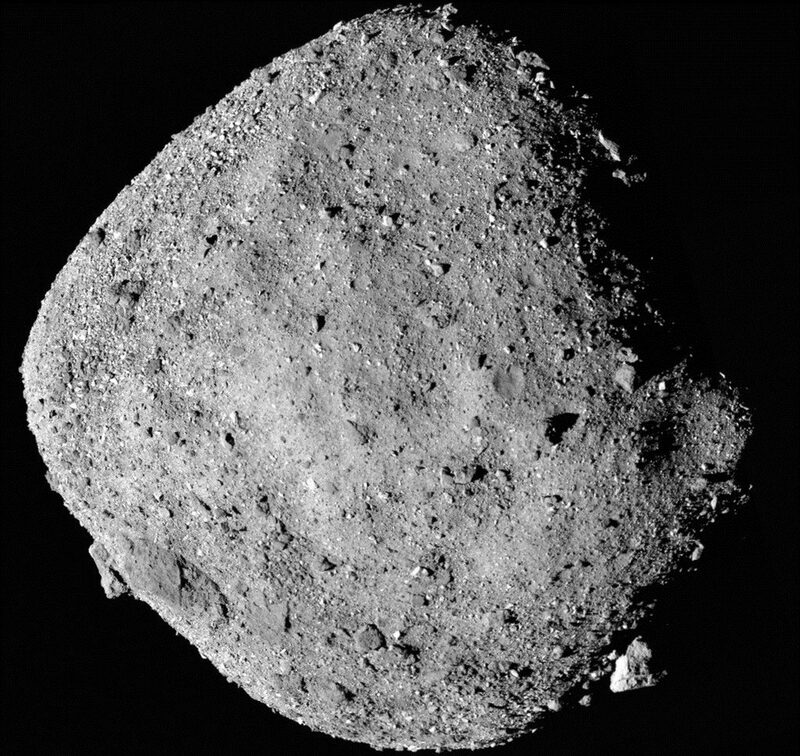 Hayabusa was the first spacecraft ever that has landed on an asteroid and returned to earth with some asteroid material. 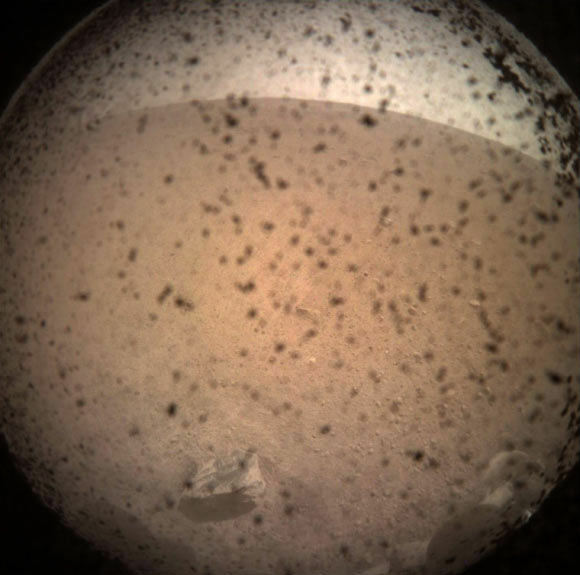 Not as much as was hoped for, because the mission encountered quite a few technical problems. 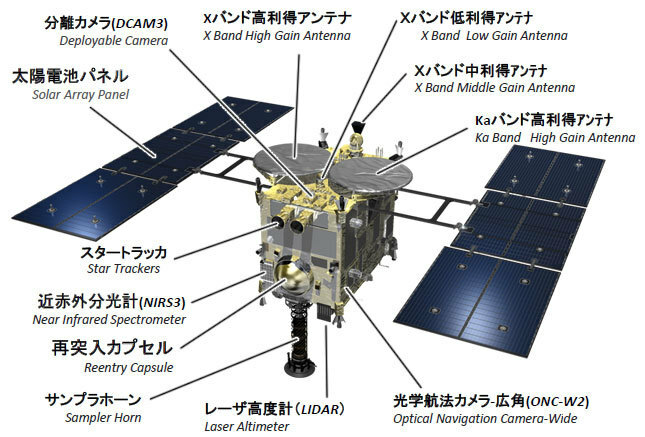 Therefore a second, improved Hayabusa2 spacecraft, was designed and launched on 3 December 2014. Destination? A tiny asteroid, 1999 JU3.. In an earlier post I have explained the complicated naming of the minor planets. The J stands for the first half of May, U stands for 20 and the subscript 3 means 3×25. 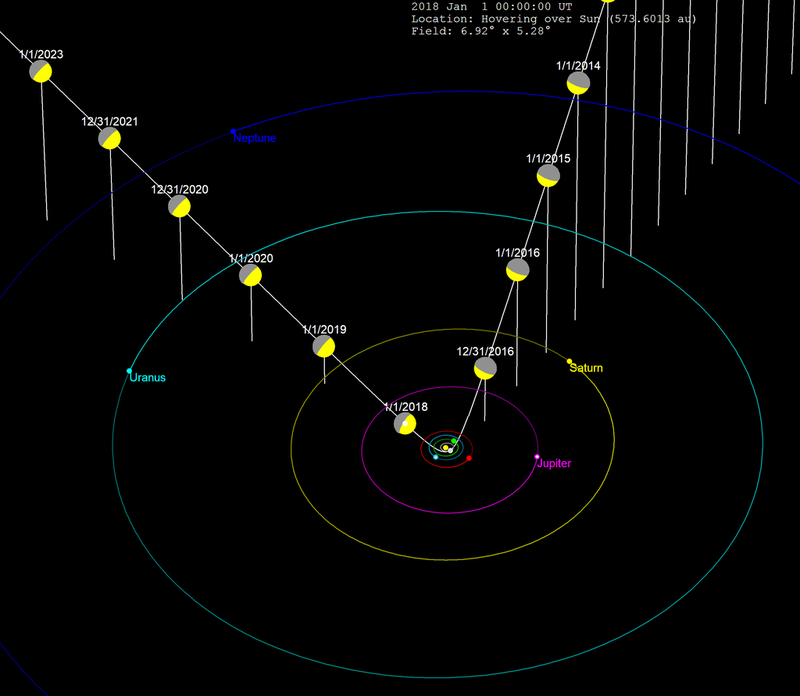 So this asteroid was the 95th minor planet, discovered in the first half of May 1999. 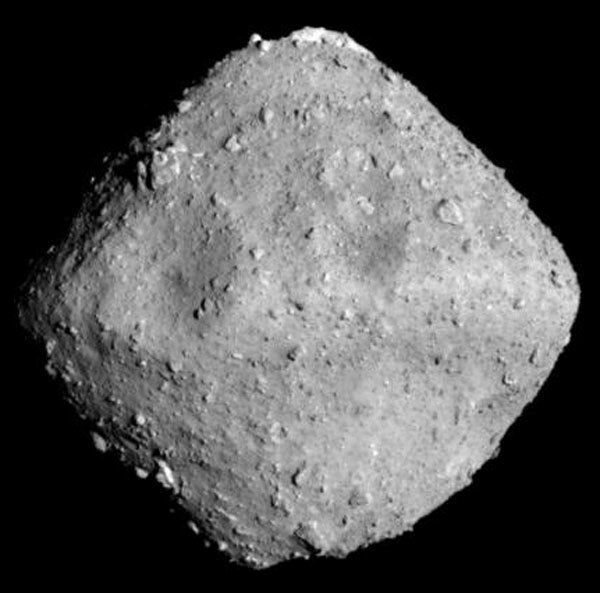 This provisional name is replaced by a number and sometimes a name, in this case 162173 Ryugu. It is the 162173th minor planet and the name has been suggested by JAXA, the Japanese counterpart of NASA. Here is the route followed by Hayabusa2 to Ryugu.The Earth orbit in blue, Ryugu in green and the Hayabusa2 in purple. Properties of Ryugu: not really spherical, diamond-shaped, a diameter of ~ 900 m and a rotation period of 7.6 hours. 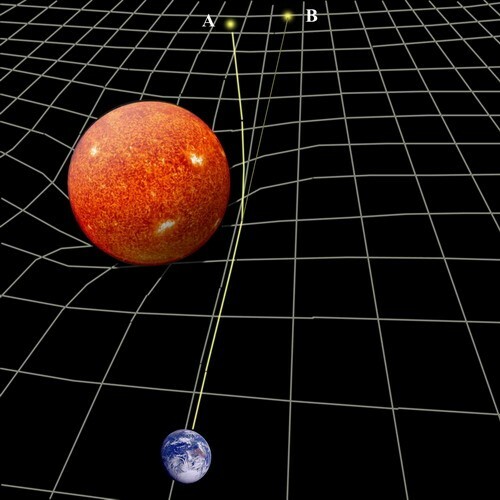 The gravitation at its surface is about 80.000 times smaller than on Earth! 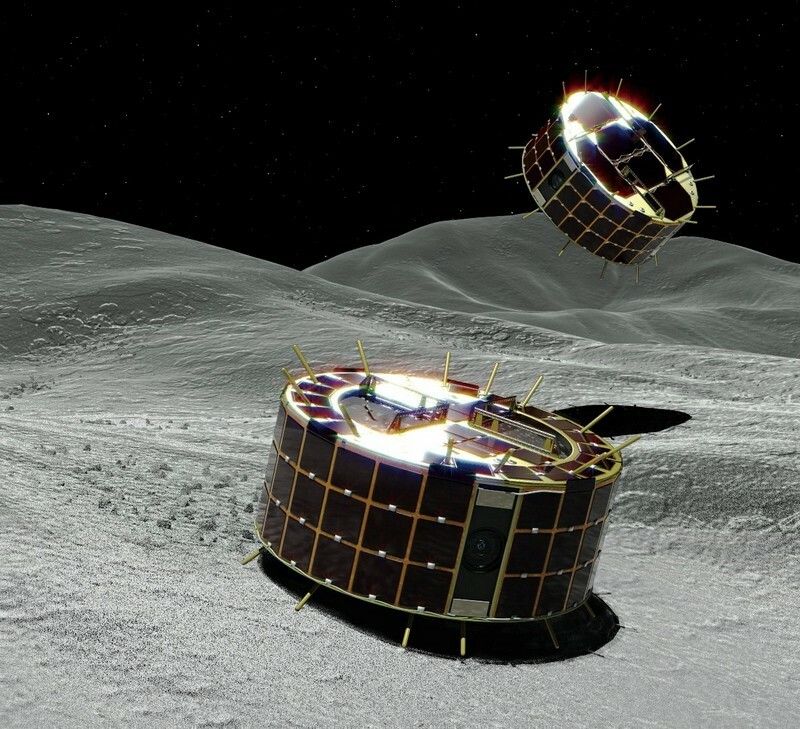 Until December 2019 Hayabusa2 will stay near Ryugu, at a distance of 20 km (HP, home position), where the gravitational attraction of the asteroid is almost nothing. From there it will investigate the properties of the asteroid and several times it will descend for a short time to the asteroid. 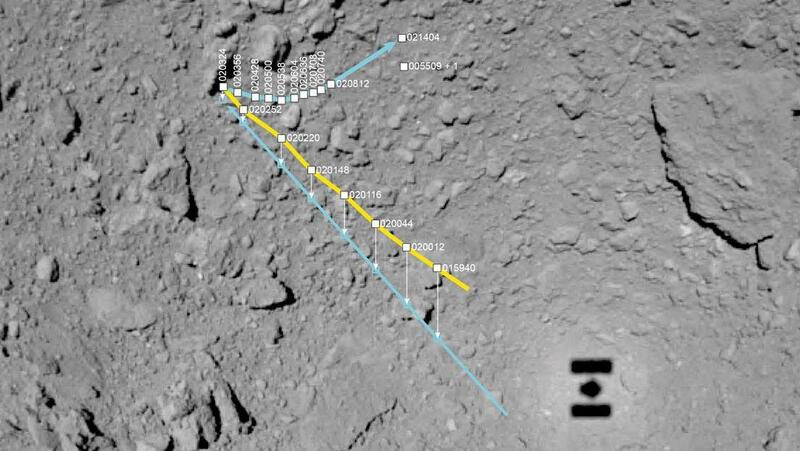 On 20 September the spacecraft started a slow, controlled descent and one day later, 55 m above the surface of Ryugu, it dropped two Minerva rovers. While they were falling down to the surface, Hayabusa2 ascended to HP. 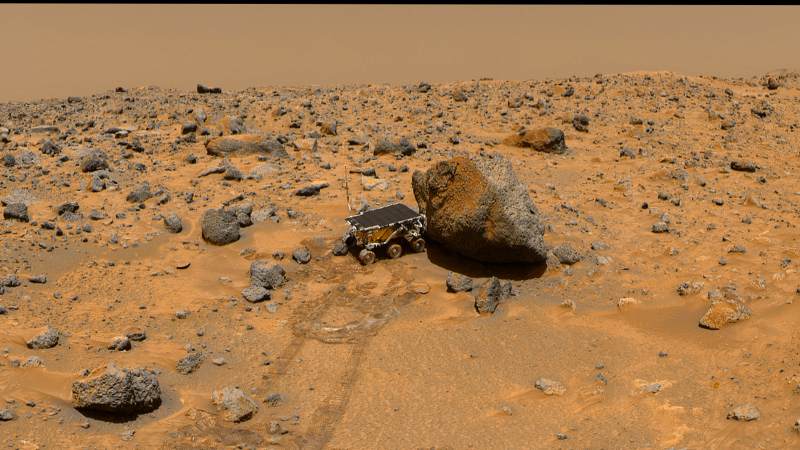 Both rovers are working correctly, a huge relief for the scientist, They are really tiny, diameter 18cm, height 7 cm, mass 1.1 kg Here is an artist impression. 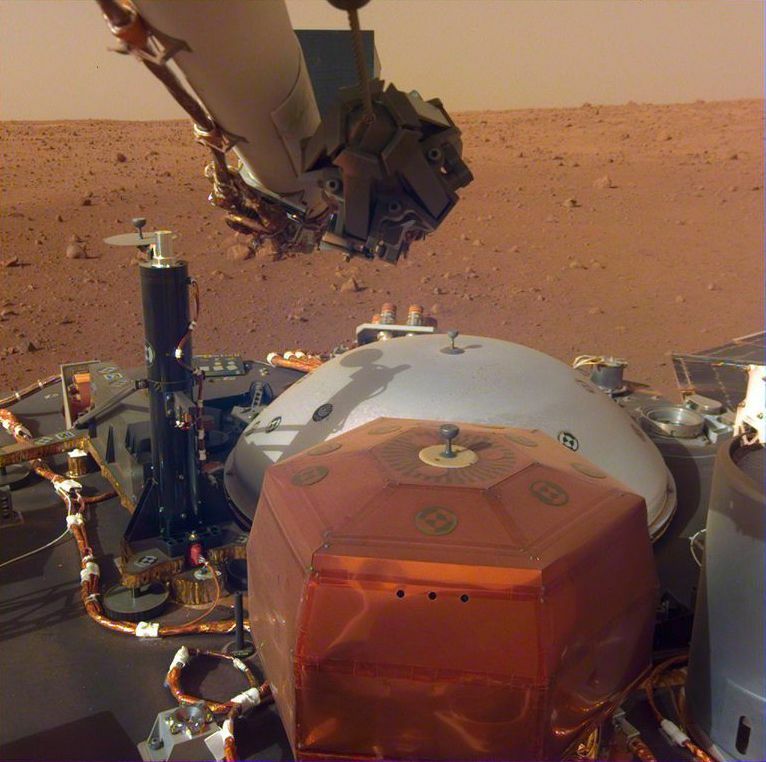 Both rovers have multiple cameras and temperature sensors on board They can move around by “hopping” and do this autonomously! 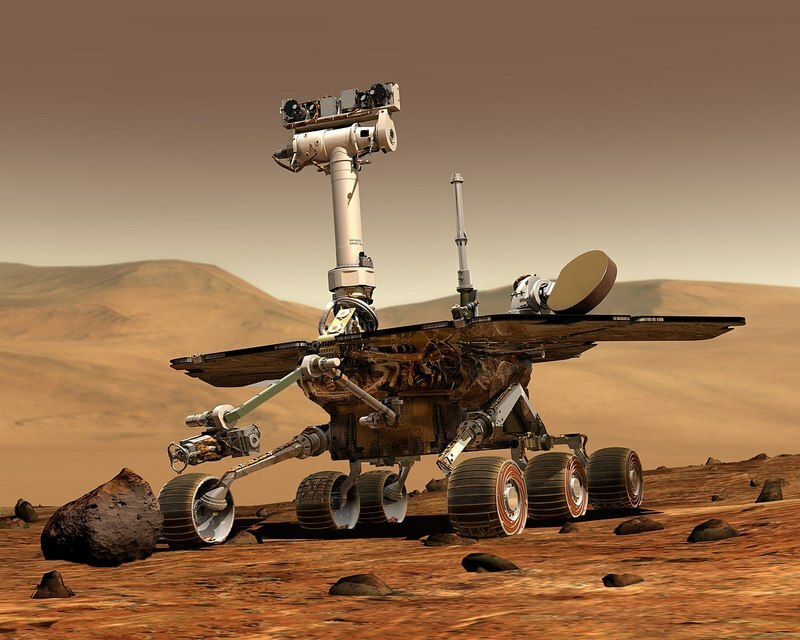 Wheels like for example the Mars rover has, would not work in this low gravity world. 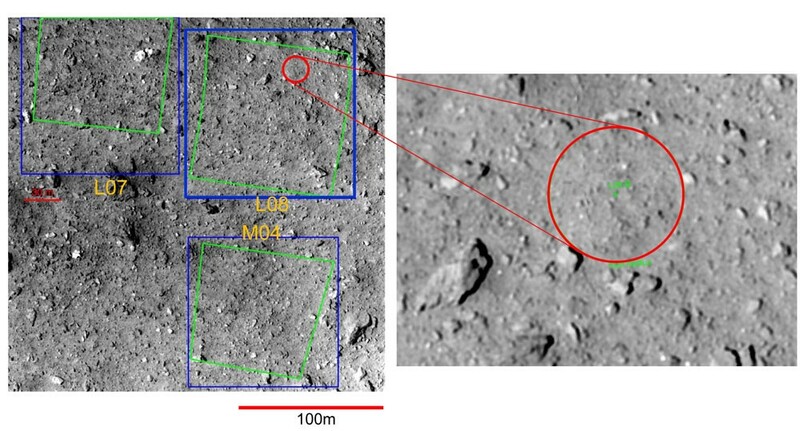 One hop can take 15 minutes and move the rover horizontally ~15 m.
This is a picture of the Ryugu surface, taken by one of the rovers.The scientists are surprised that the surface is so rough. 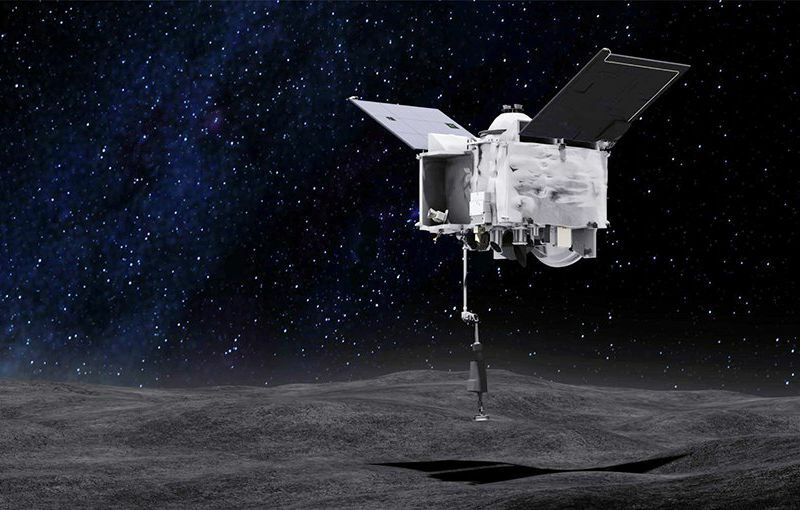 On 3 October, the spacecraft descended again to Ryugu, to drop the MASCOT lander, developed by the German and French space agencies. A bit larger and heavier, size of a shoebox, mass ~10 kg. Contains cameras and various scientific instruments. 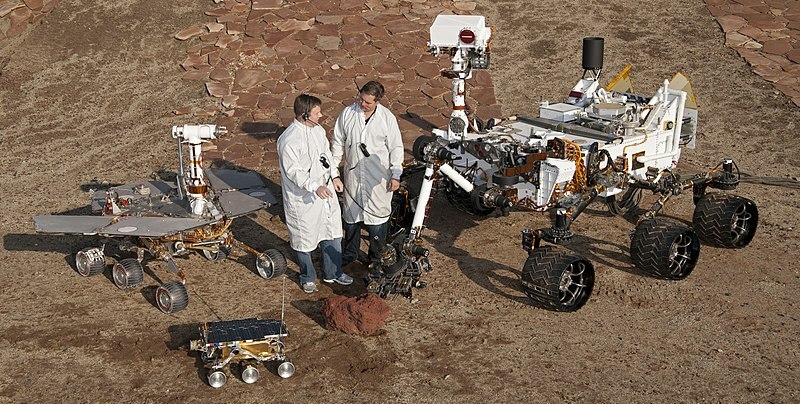 No solar cells like the two rovers, but battery operated, able to provide power during 16 hours. Also able to hop, like the rovers. 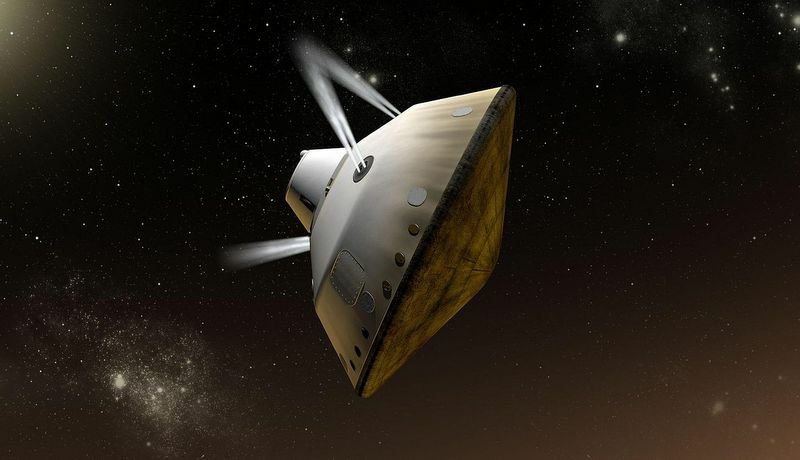 This is an artist impression of the MASCOT, leaving its container in Hayabusa2. Here are two images taken by MASCOT itself. Left while descending to the surface and yes, that is its own shadow top right. 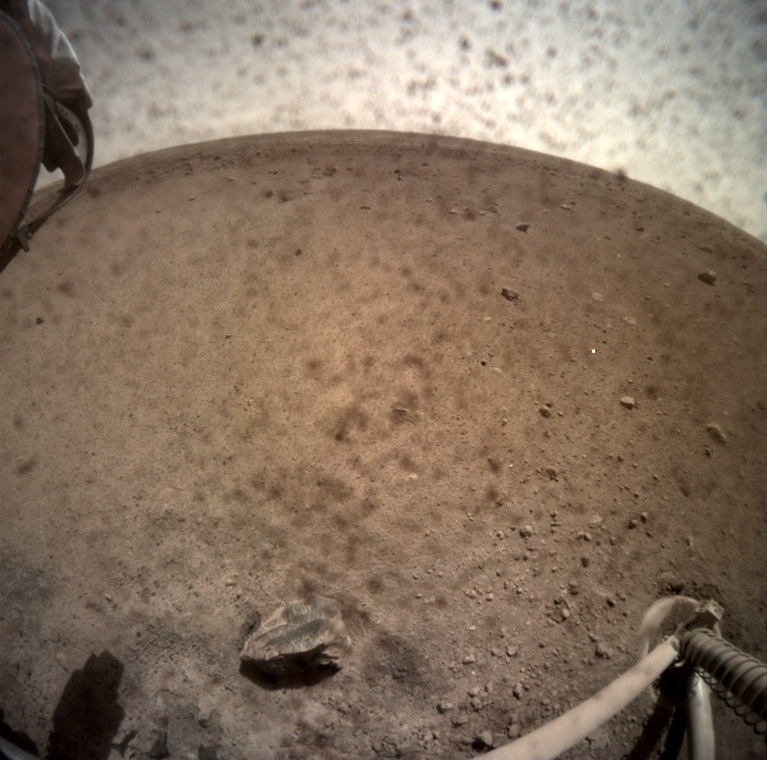 Right after landing, again showing a very rough surface. 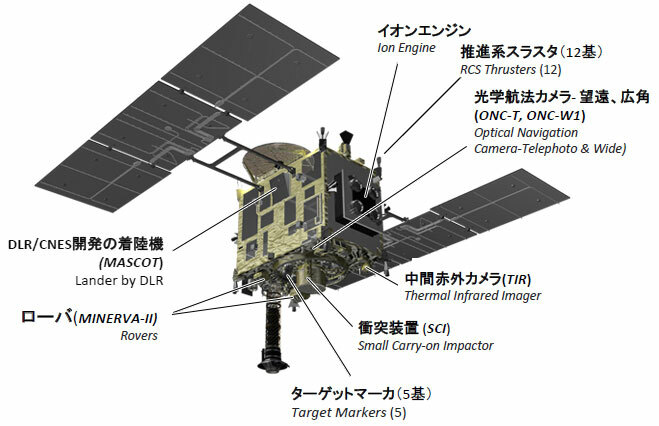 After the successful landing, MASCOT started to use its scientific instruments (spectrometer, magnetometer and radiometer) and sent the data back to Hayabusa2 within the limited timespan of 16 hours. Actually the batteries lasted one hour more, a bonus. It hopped two times. Until now the mission has been very successful: two rovers and one lander have touched an asteroid for the first time in history! 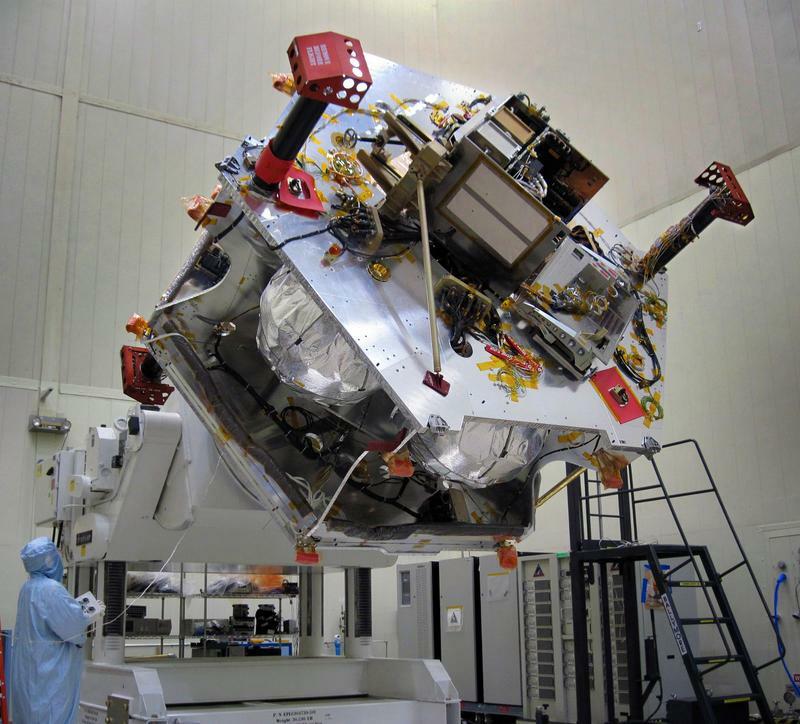 This is the procedure: the Hayabusa2 will descend very slowly to the asteroid until the horn touches the surface. Then a small (5g) bullet will be fired inside the horn, hit the surface at high speed and surface particles will fly up and be collected at the top of the horn. Hopefully at least 0.1 gram, maximum 10 gram. This will be done at two different locations. The third and last one is quite spectacular, an attempt to collect material below the surface. 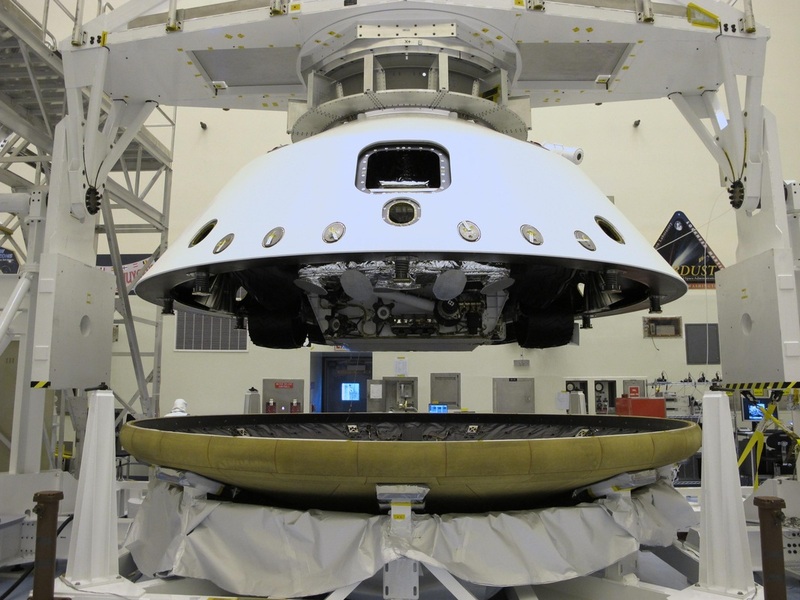 Here is another view of the bottom of the spacecraft. Next to the horn you see the Small Carry-on Impactor. 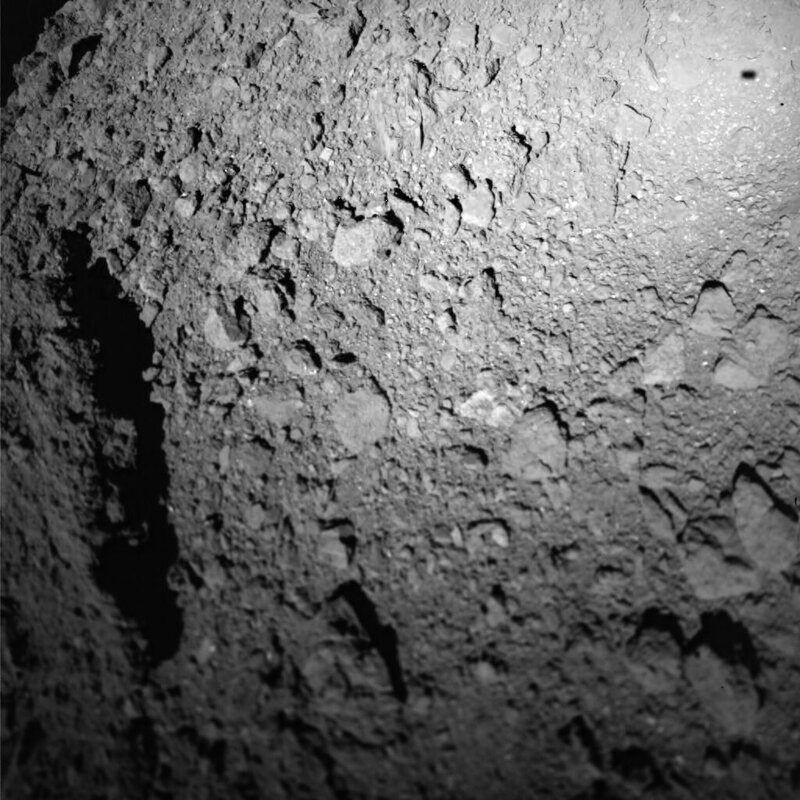 Hayabusa2 approaches the surface of Ryugu. It releases the bomb and also a camera. Then it moves up and sideward to hide itself behind the asteroid! 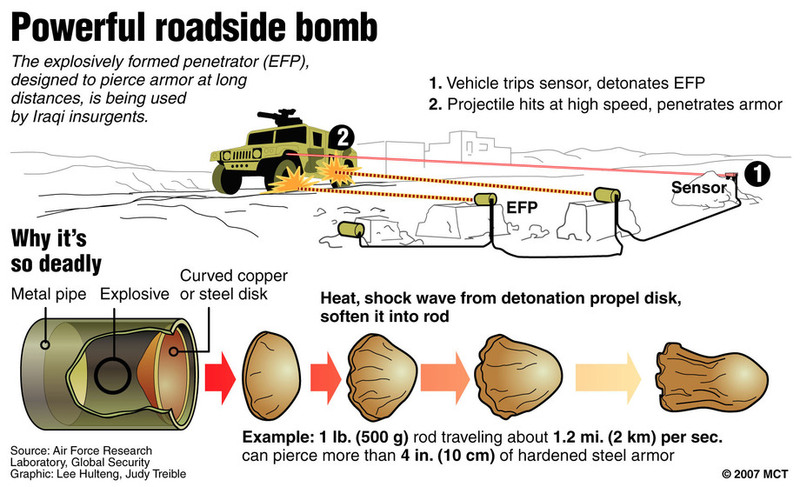 The bomb explodes and creates a crater. The camera takes images and sends them to Hayabusa2. Hayabusa2 appears again and descends above the crater. Here is an artist impression, where Hayabusa2 is descending above the newly formed crater. 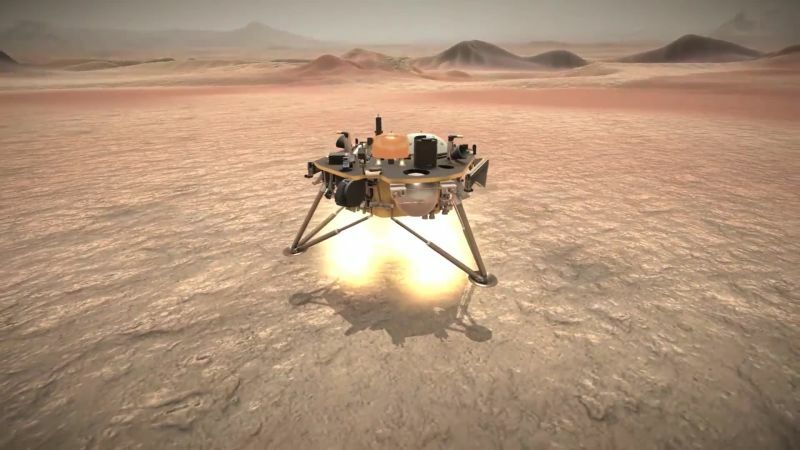 The first touchdown of the spacecraft itself was planned for end October, but it has been postponed until January 2019. 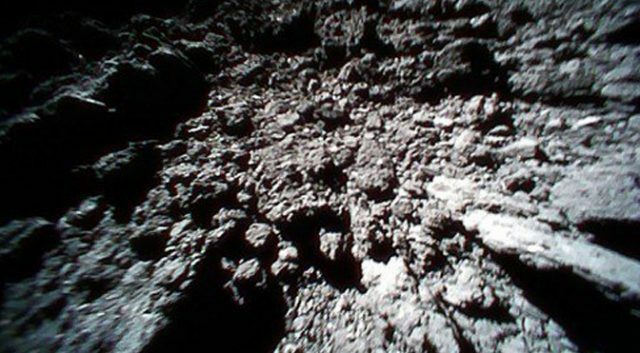 Because the surface of Ryugu is much rougher than expected! 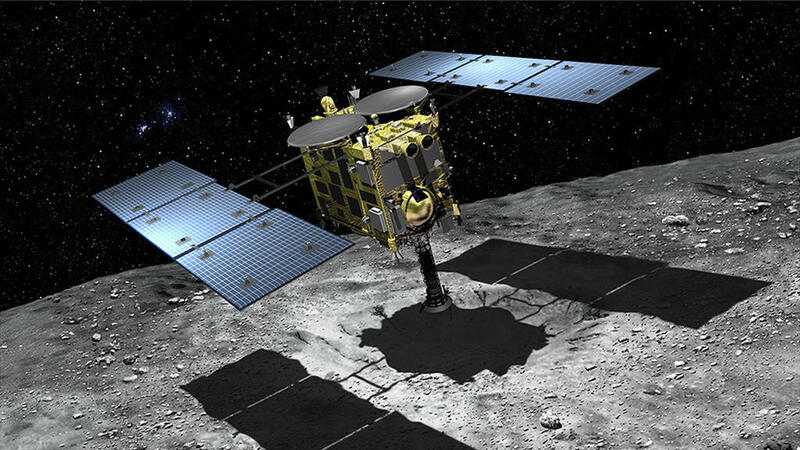 The horn of Hayabusa2 extends about 1 m, therefore the touchdown area should not have rocks higher than 50 cm. 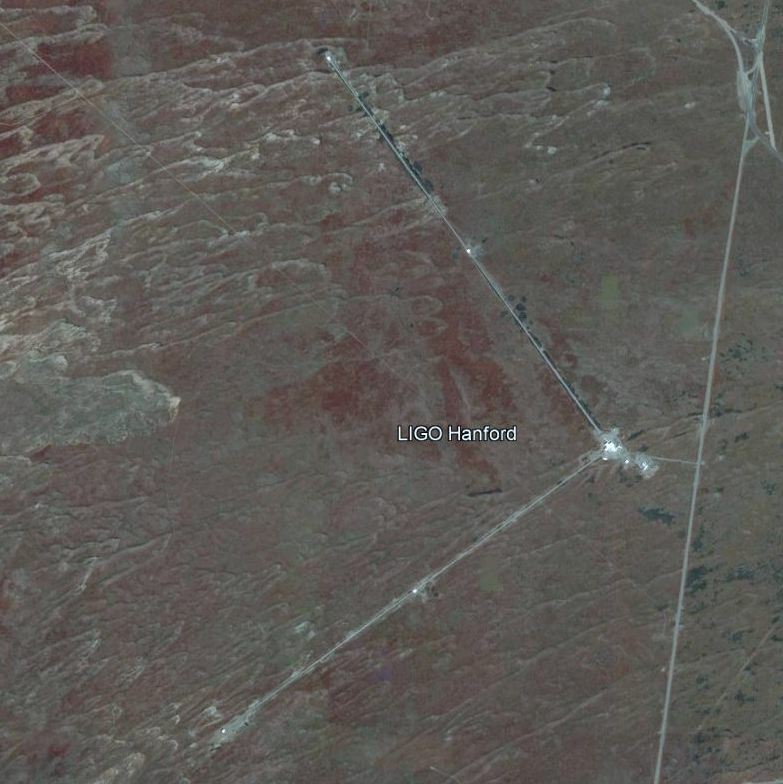 The touchdown area must also have a diameter of at least 100 m because of navigational accuracy. Such a location could not be found on Ryugu!. Below is the one finally chosen (red circle) free of rocks, but ONLY 20 m in diameter! There is also some good news. 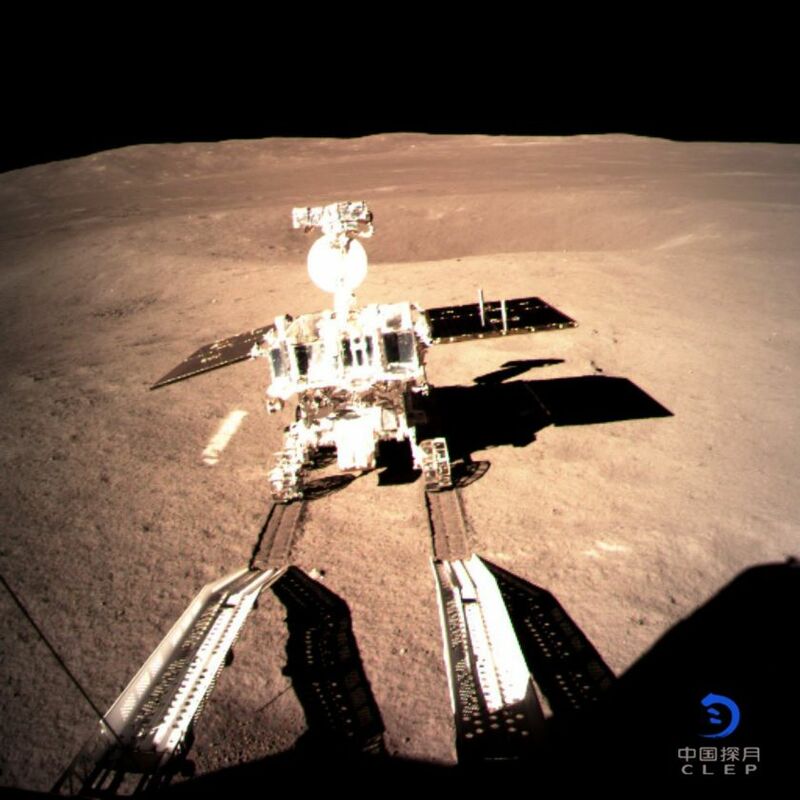 The earlier launching of the rovers and the MASCOT showed that navigation (with laser range finders) could be done more accurately (within 10 m), at least until the altitude of 50 m above the surface. In the next weeks, two rehearsals will be performed, going lower, to find out whether tis accuracy can be maintained until touchdown. 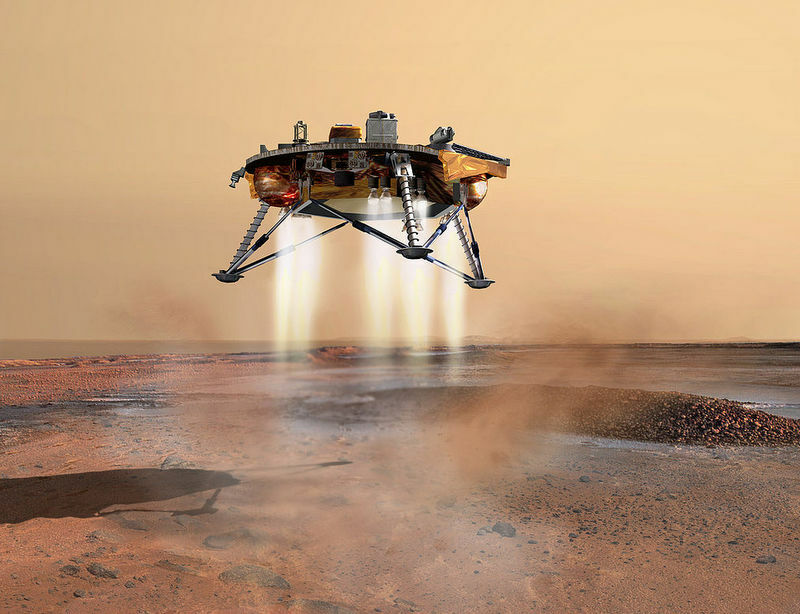 The first real touchdown is now planned for January next year. 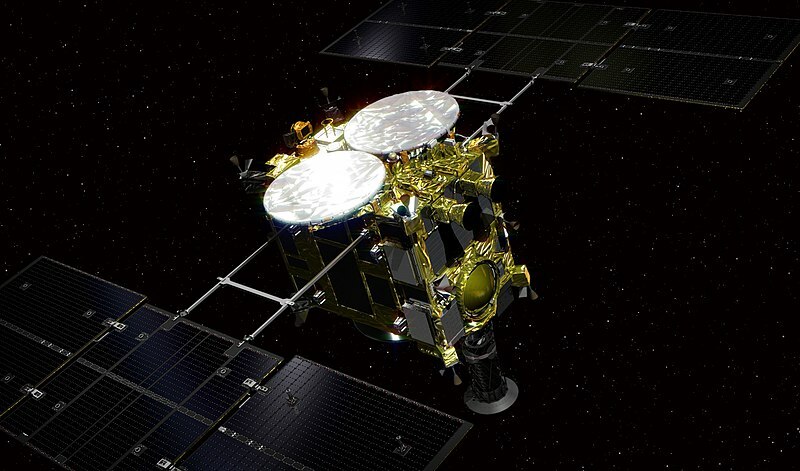 There is enough time because Hayabusa2 will stay at Ryugu until December 2019. 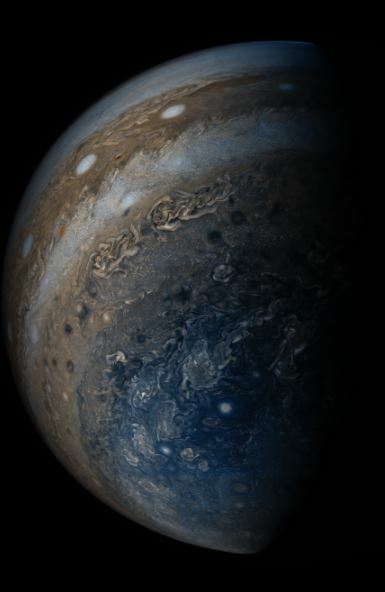 All this is happening at about 300 million km away from Earth. Amazing. 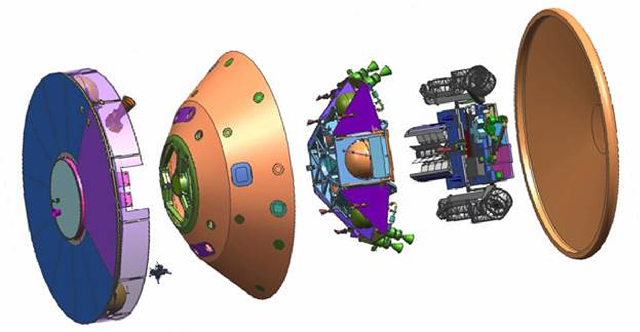 Keep in mind that communication between Earth and the spacecraft takes about 15 minutes, one way! 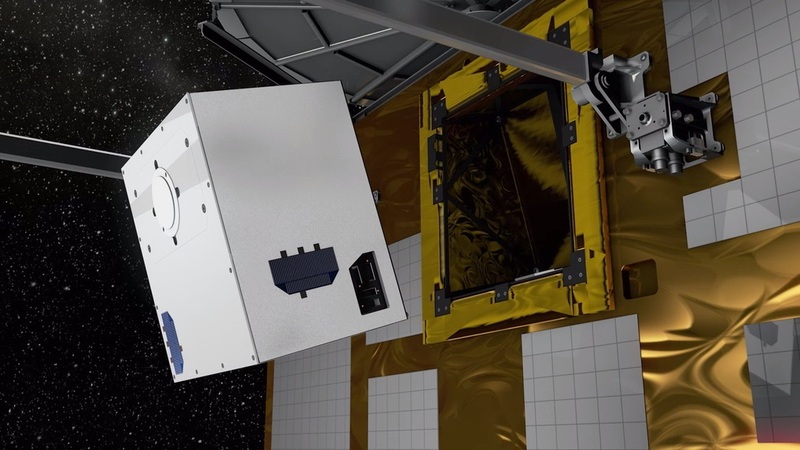 The German Space Agency has published a very instructive YouTube video, illustrating what I have tried to explain in this blog. 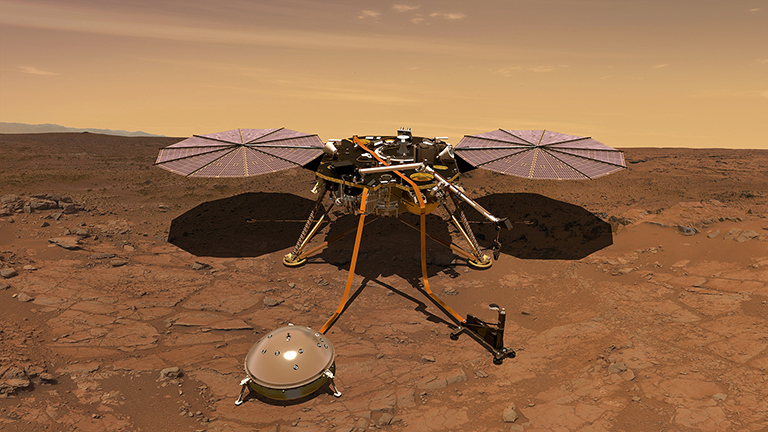 Not only about the MASCOT lander as the title suggests. Worth viewing more than one time! 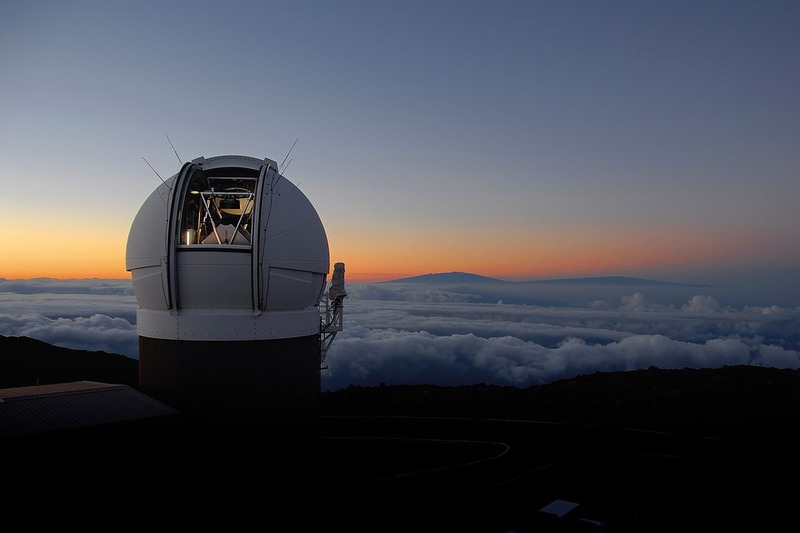 The function of this telescope is to scan the sky, looking for moving astronomical objects, like comets and asteroids. The idea is simple, you take two pictures of a part of the sky, at different times and compare them. 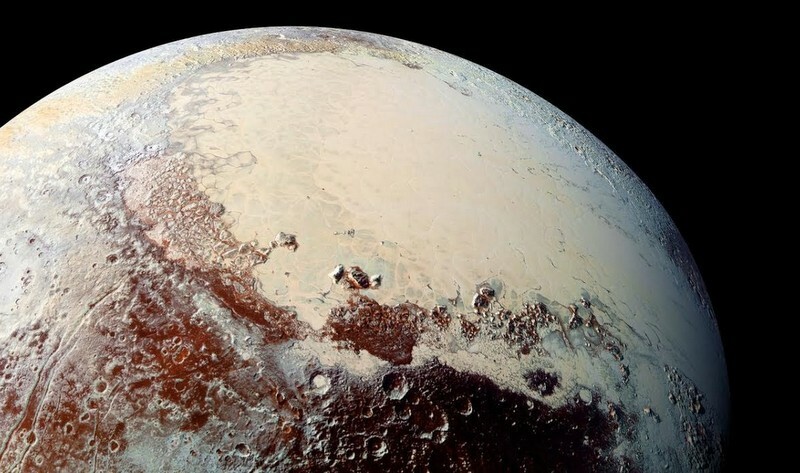 In 1930 the planet Pluto has been discovered this way. 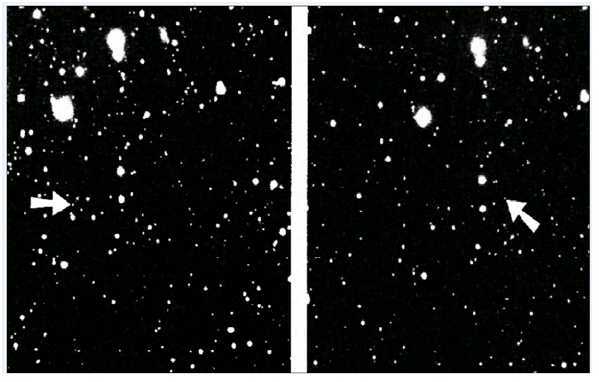 Here are the original photographs, taken 6 days apart, the arrows point to Pluto. In those days the astronomer used a gadget, called a blink comparator, which rapidly switched from viewing one photograph to viewing the other. The moving object would stand out by “blinking”. 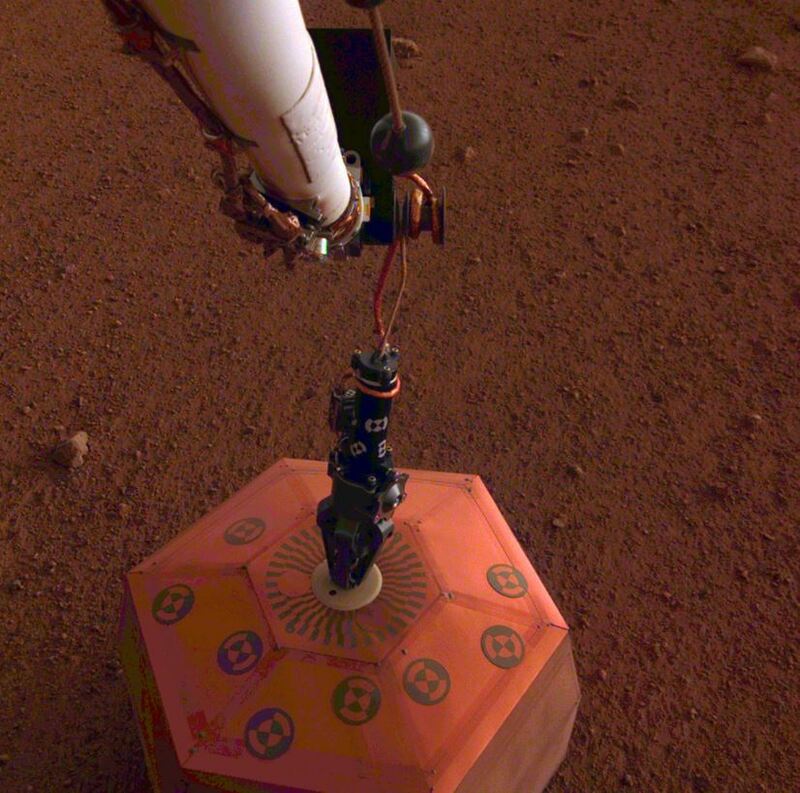 Nowadays computers can do this much better than humans, and Pan-STARRS is connected to a sophisticated computer system, that not only analyses the images, but also communicates with other observatories all over the world, when moving objects are found. A short intermezzo about the classification of comets. The first letter describes the kind of object, P for a periodic comet, C for a comet with unknown period and A for an object that was first classified as a comet but is actually an asteroid. There are a few more categories. The letter is followed by the year of discovery and by a letter that indicates the “half-month” of discovery. A for the first half of January, B for the second half, C for the first half of February, etc. The letter I is not used, so the U means that the object was discovered in the second half of October. It is here followed by the number 1, because it was the first discovery in that half-month. Further observation of this asteroid, by many other observatories, showed that it came from OUTSIDE our solar system! 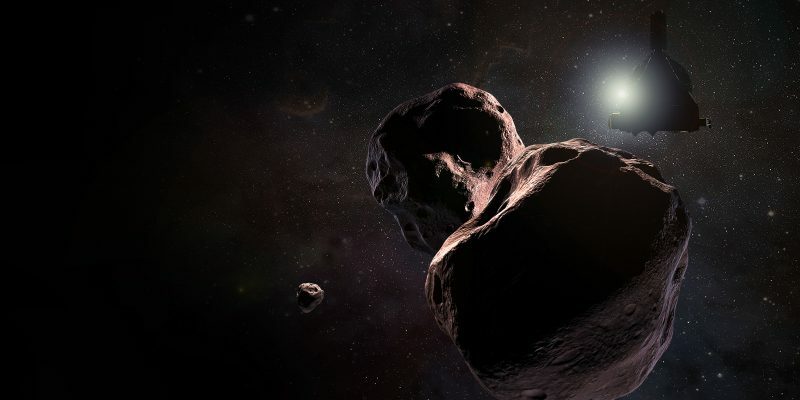 A few years ago I have published a post about NEO’s, Visitors from Outer Space, but Outer Space stands there for the Kuiper Belt and the Oort cloud, both still belonging to our solar system. 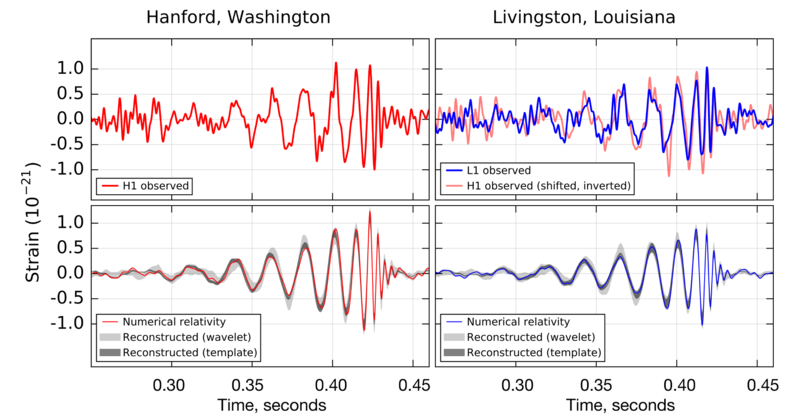 So this was an EXTRAORDINARY event, the first observation of an object that came from another star! 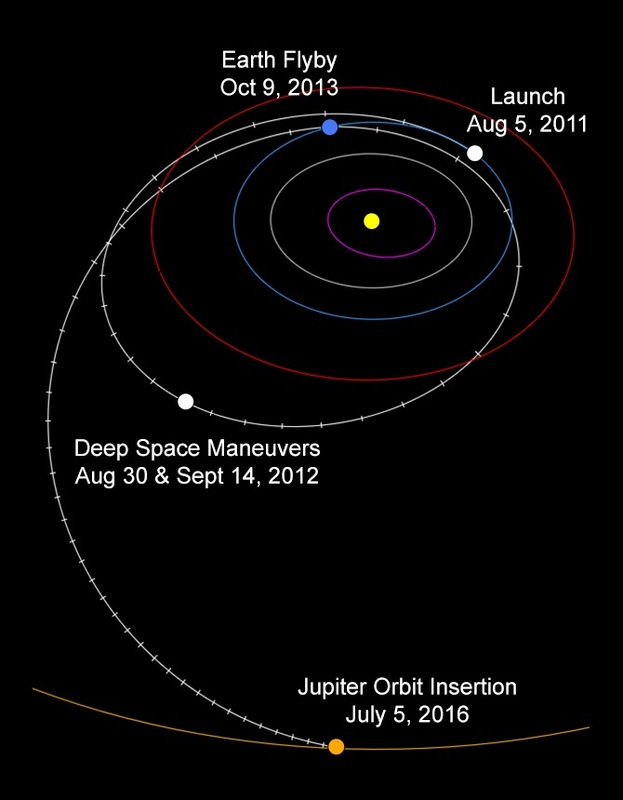 On 6 November 2017, less than three weeks after its discovery, it was reclassified again, as 1I/2017 U1 , where a new category was introduced, I, standing for Interstellar object. The number 1 in front of the I was added, because it was the first occurrence of this new category. And it was given a proper name: ʻOumuamua, which in the Hawaiian language means “a messenger from afar arriving first“. The symbol ʻ in front of the name is not a typo, but a ʻokina, a glottal stop. 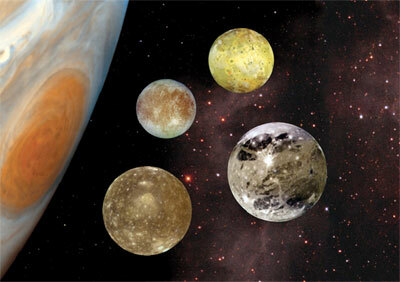 How do the astronomers know that it comes from outside our solar system? By its speed and its orbit! 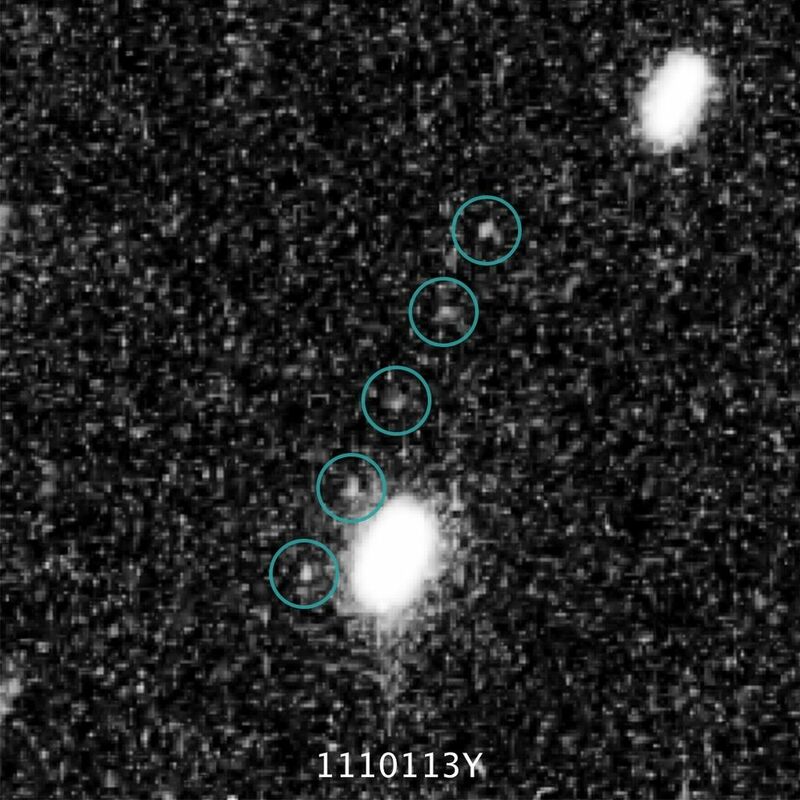 Here is an animated gif of ʻOumuamua’s orbit. The orbit is hyperbolic ! 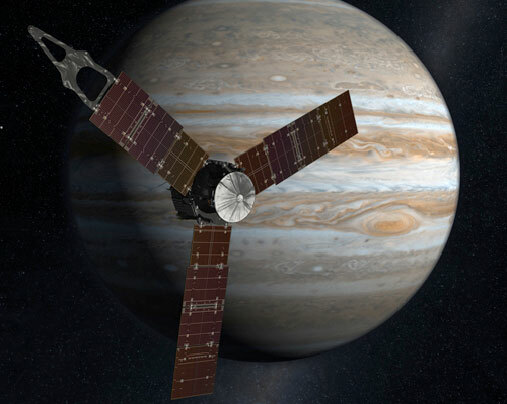 From far away it approached the solar system with a velocity of ~26 km/s. 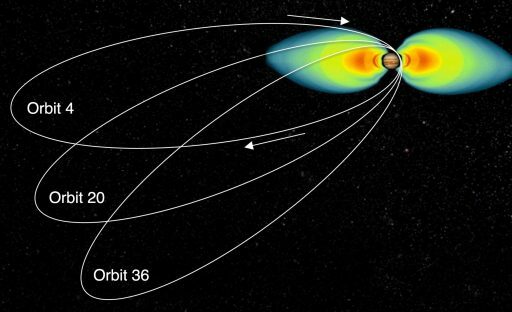 Attracted by the Sun, its velocity increased to ~88 km/s at perihelion, on 9 September 2017. When it was discovered by Pan-STARRS, 40 days later, it was already on its way out. 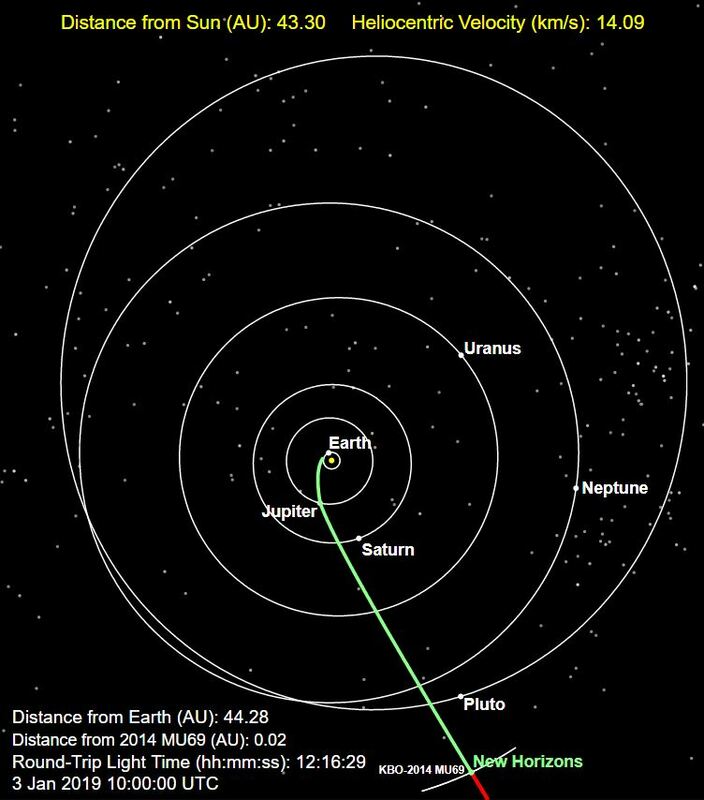 Here is another sketch of ʻOumuamua’s orbit, with dates. Try to view it “3-dimensional”, the orbital plane of ʻOumuamua is tilted with respect to the ecliptic (the orbital plane of the planets). Is there anything more that we know about this visitor from outer space? For example from which star it started and how long it is underway? It arrived roughly from the direction of the star Vega, 25 lightyear away. In that case, with its velocity it would have taken ~ 600.000 year to reach our solar system. But Vega was not in the same location, that long ago. 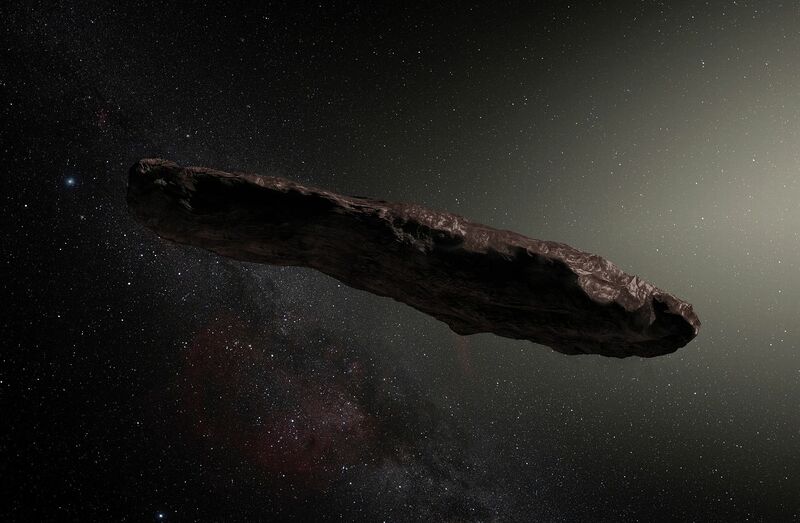 We just don’t know, ʻOumuamua could have left its star system billions of years ago. You may wonder how anything can be said about the shape, as the image of ʻOumuamua is only a single pixel in even the strongest telescopes! The answer is that the asteroid is “tumbling” with a period of ~ 8 hours. Therefore the amount of light it reflects varies. Here are the measurements done by several telescopes, with a theoretical fit, assuming a 1:10 ratio between length and width Click to enlarge. Of course there are people who are wondering if it could be a spaceship…:-). In that case it would probably be out of control or abandoned, because of the tumbling. 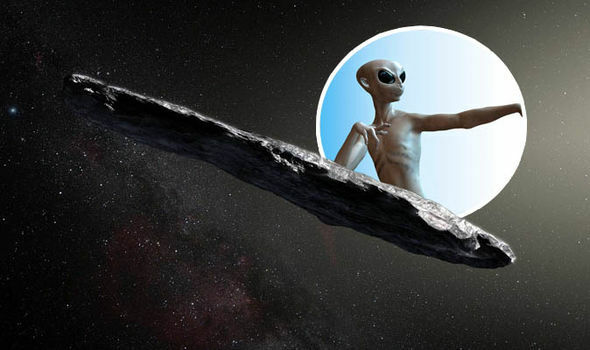 Anyway, both SETI and Breakthrough have been listening for any signals coming from ʻOumuamua. Without results. For this blog I have used the very informative Wikipedia article about ʻOumuamua and other Internet sources. Are you using Whatsapp and did you recently receive this picture? 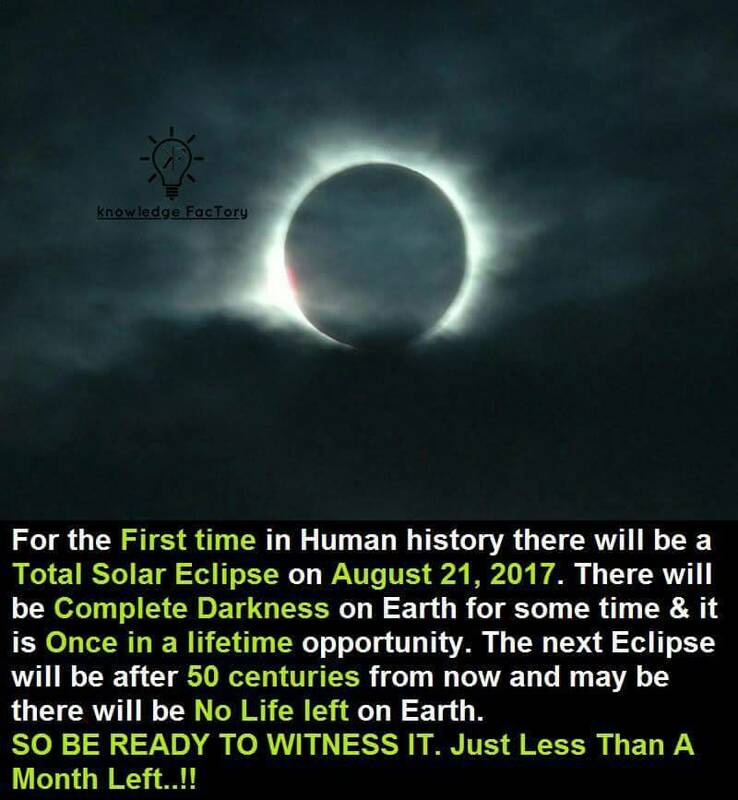 Getting excited already, that in a few weeks time you will observe a unique event? 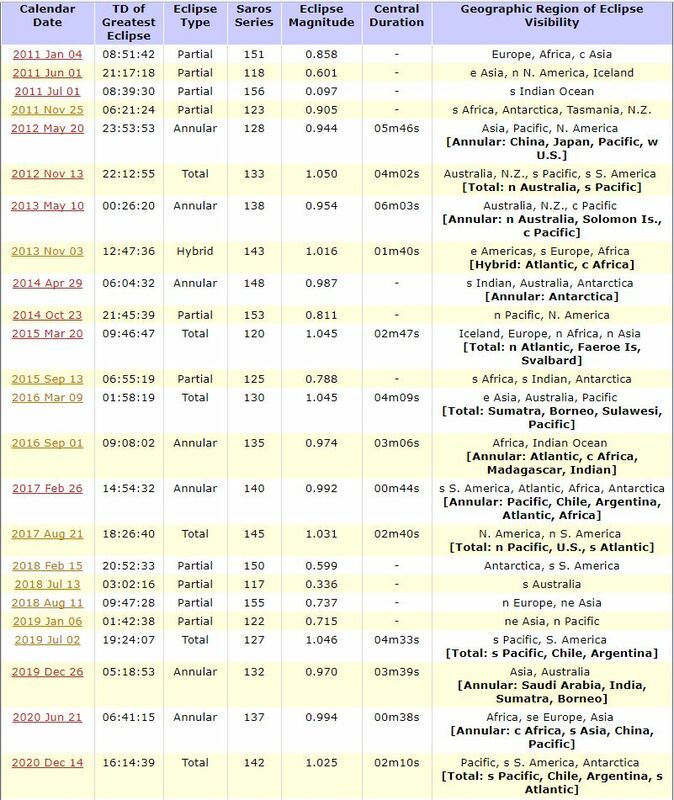 Here is a list of solar eclipses between 2011 and 2020. In the third column the type of eclipse is given. Twenty four eclipses in total, five of them total. The last column gives the geographic region where the eclipse will be visible. The moon orbits the earth in about 29 days, so you would expect a solar eclipse roughly every month. But the orbital plane of the moon is tilted 5 degrees, therefore the shadow of the moon will not touch the earth every month. Also, because of the (big) size of the sun, the shadow of the moon (the white lines) just reaches a small part of the earth. The pink lines mark the region where the moon blocks the sun only partially. Another effect is that the orbit of the moon is slightly elliptical, so the distance of the moon to the earth is not always the same. If the moon passes between the sun and earth while it is farther away from the earth, it can not block the sun completely, resulting in an “annular” eclipse. Let us look in a bit more detail at the 21 August eclipse. The blue band is where you can see the total eclipse. 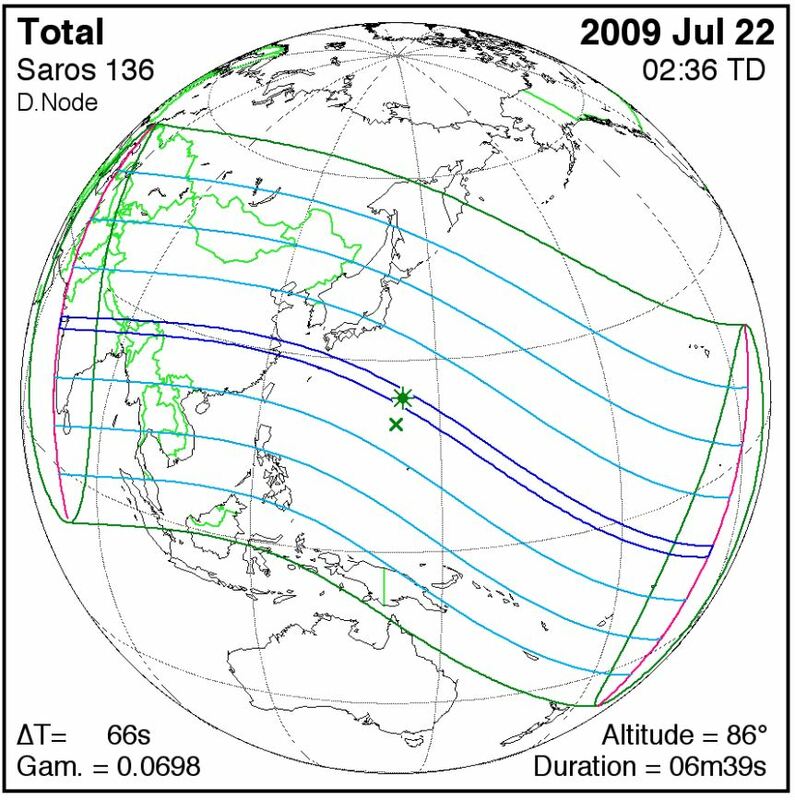 Weather permitting of course…:-) The light blue lines parallel to the blue band indicate the regions where you have a 75%, 50% and 25% partial eclipse. 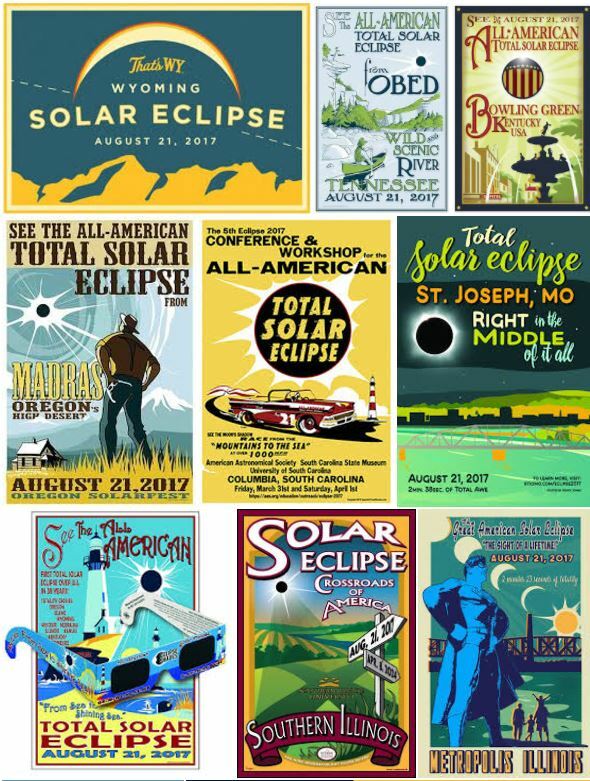 Of course there is a lot of interest in the USA for this Great American Eclipse . Here are a few advertisements, taken from the Internet. But also for the USA it is not a unique event. 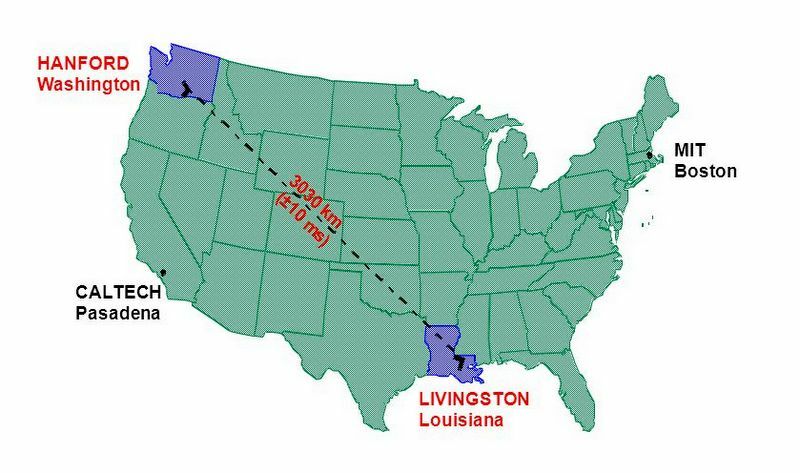 The last total eclipse, visible in mainland USA, was on 26 February 1979 and the next one will be on 8 April 2024. 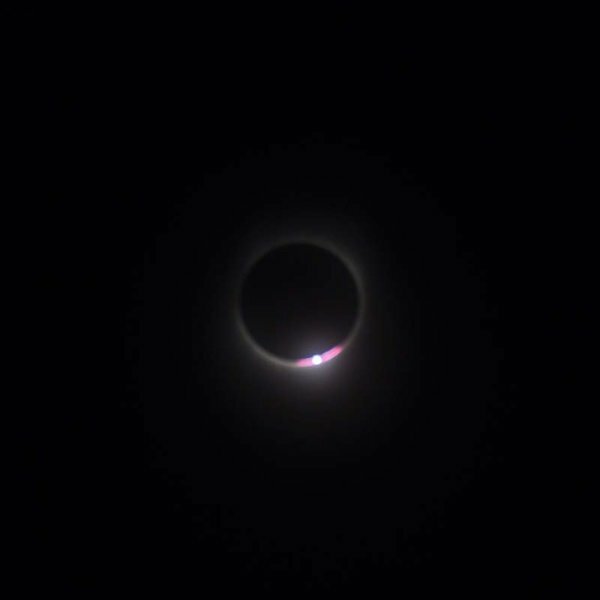 Total eclipses are spectacular. 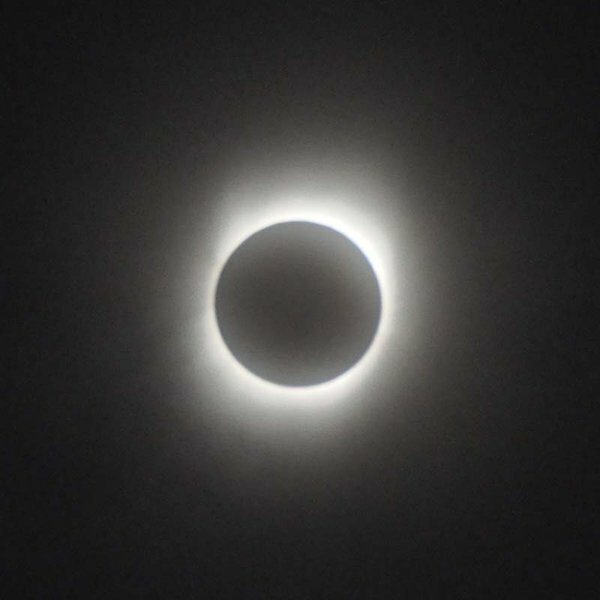 It gets dark, and the solar corona becomes visible. A reason for many people to travel to a region where the total eclipse can be watched. Actually I was one of them, 8 years ago! We decided to visit China, Hangzhou region, around that time, hoping for clear skies. The full report you can read here: China July 2009 part I: Hangzhou. 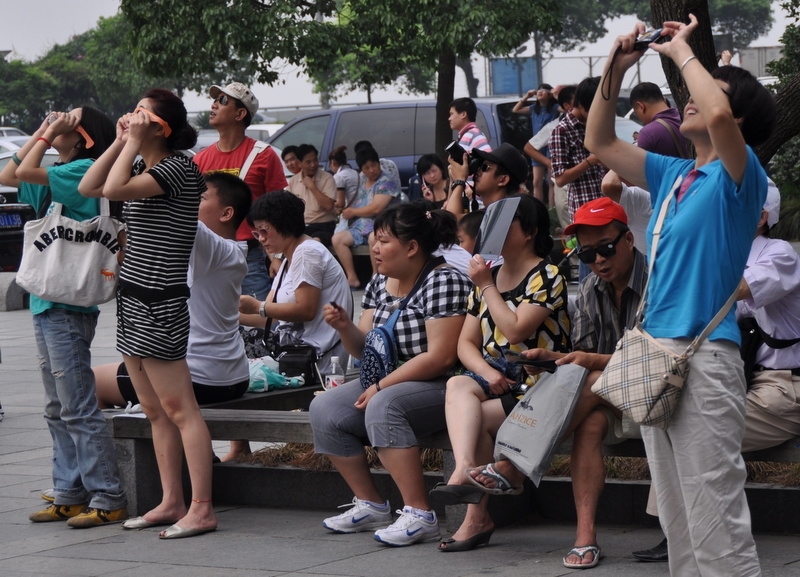 Many people, locals and tourists, full of expectation. Actually it was rather cloudy. 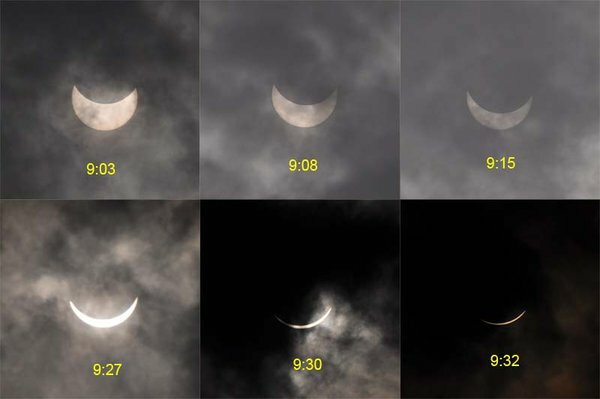 Here you see pictures during the start of the eclipse. We kept our fingers crossed. It was an unforgettable experience. As it will be for the Americans (and the many foreign tourists) on 21 August. 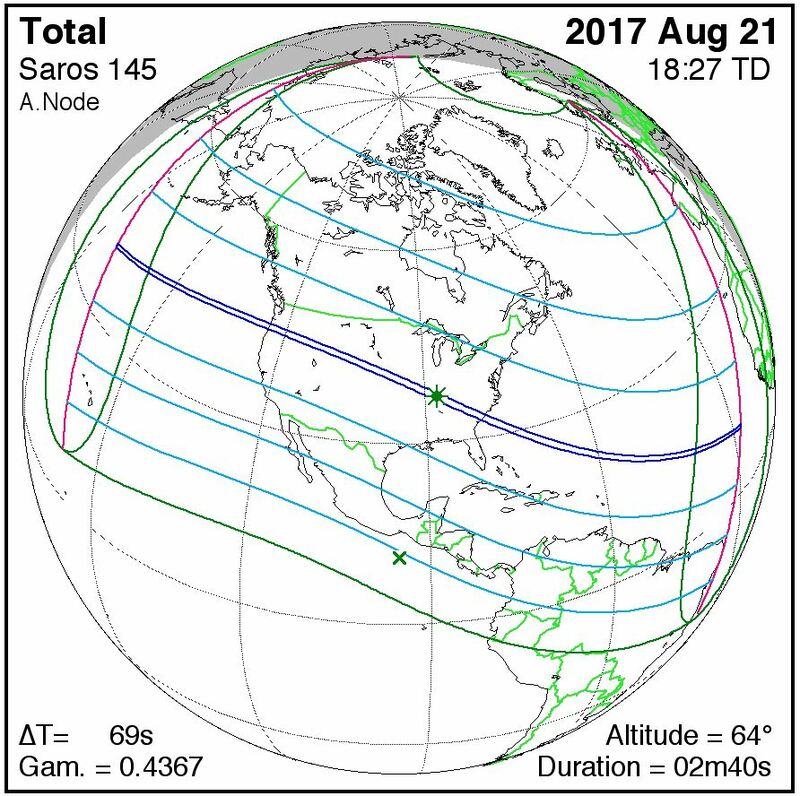 When you compare the two eclipse maps, you see in the lower right corner the duration of the totality. The China one 6m 39s, the American one “only” 2m 40s. CHINA FIRST! 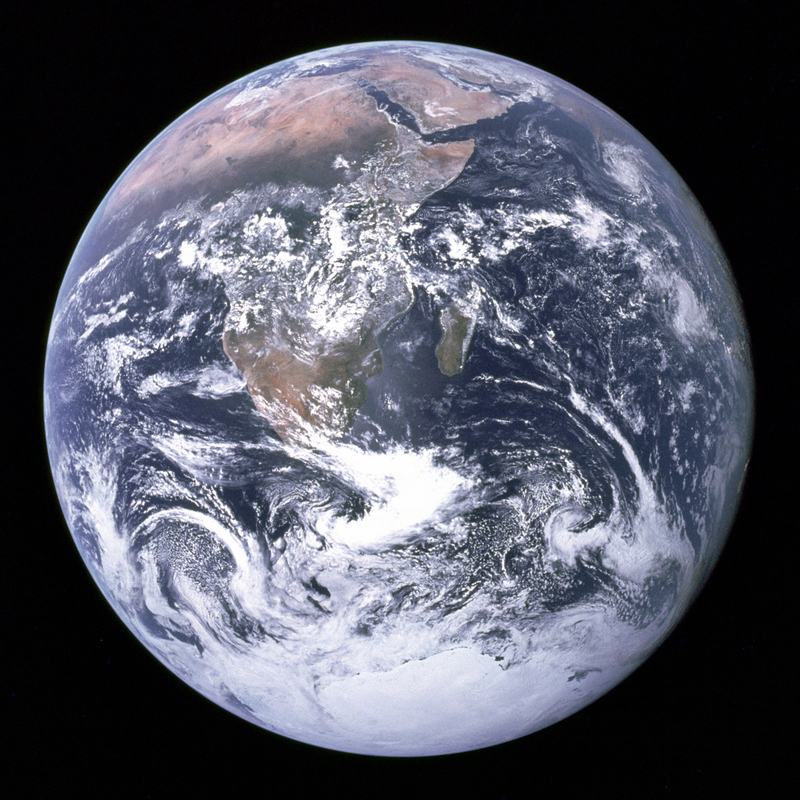 In a recent blog, Our nearest neighbour? , I reported about the discovery of the planet Proxima b, orbiting around a star, “only” 4.22 lightyear away from Earth. 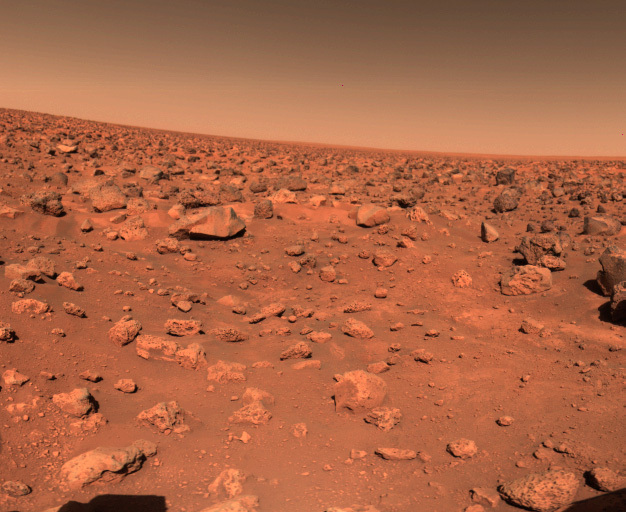 In several media it was suggested that within a few decades a spaceship could be launched to reach this planet. A spaceship is science-fiction, but there exists an ambitious plan to send a swarm of space-chips to Proxima b within a few decades. 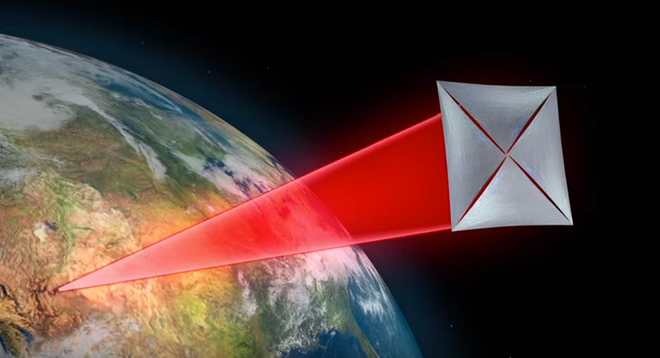 I promised to write a separate blog about this Breakthrough Starshot Here it is. 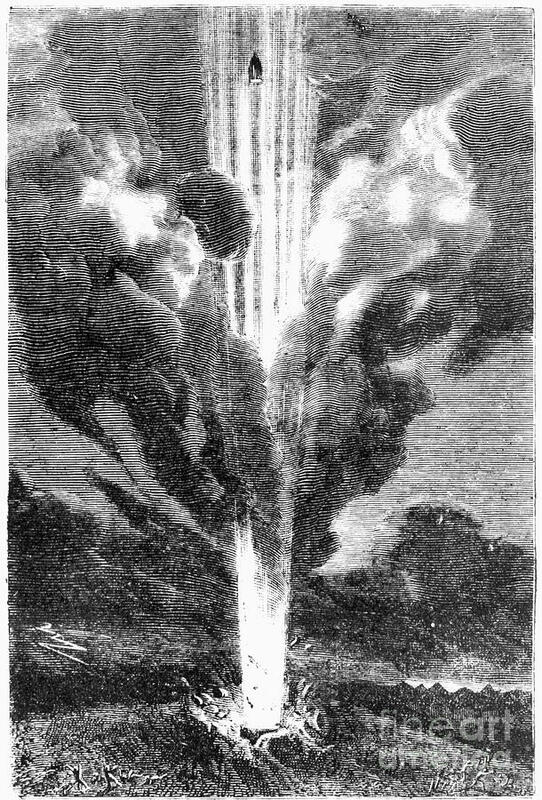 In 1865 the French novelist Jules Verne wrote De la Terre à la Lune (From the Earth to the Moon), in which he describes how three adventurers travel to the moon in a projectile, shot from the earth by a large cannon. I have read it spellbound when I was a teenager. You can read it online here , it is fascinating (and hilarious too). The illustrations are beautiful. Here are some. 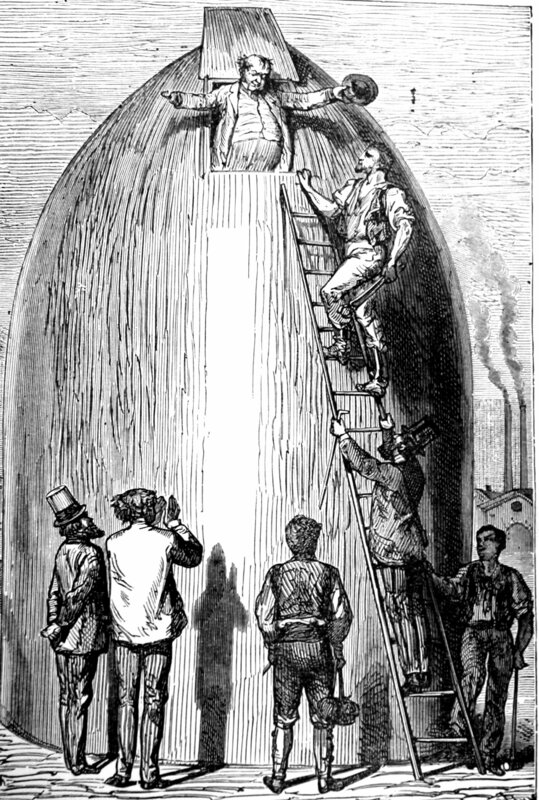 From left to right the three adventurers climbing into the projectile, the comfortable interior and the firing of the canon. Why this introduction? We know now that this method is not used in our space age. We don’t shoot our spacecraft to the moon or other planets, we use rocket propulsion. 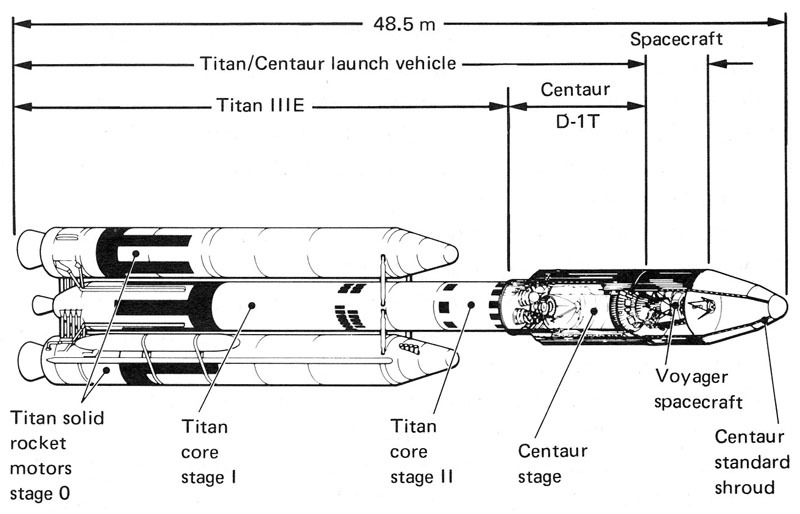 The Voyager 1 (825 kg) was launched by a Titan-Centaur rocket (600.000 kg). 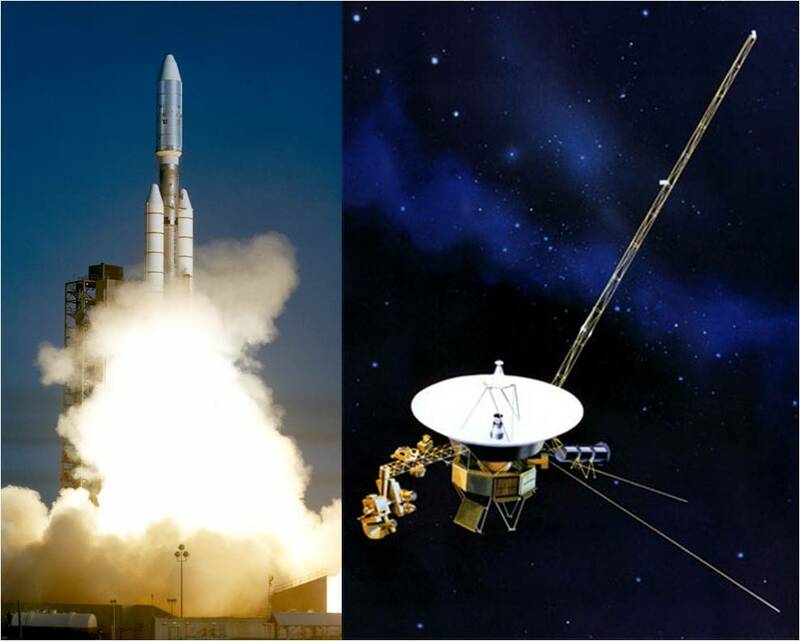 The images show the launch, the Voyager spacecraft and a structure diagram of the rocket. The Centaur is mounted on top of the Titan. 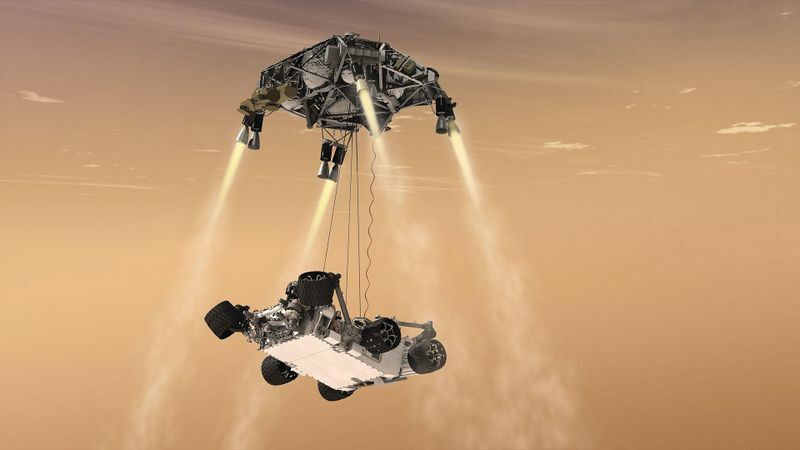 A huge amount of fuel is needed to launch a “tiny” payload! After completing its mission, the Voyager is now leaving our Solar System with a speed of more than 60.000 km/h That is fast but it would still take about 75.000 year to reach Proxima b, if it was going in that direction (which is not the case). So we can forget about space travel to the stars, using rocket propulsion, at least in the foreseeable future. 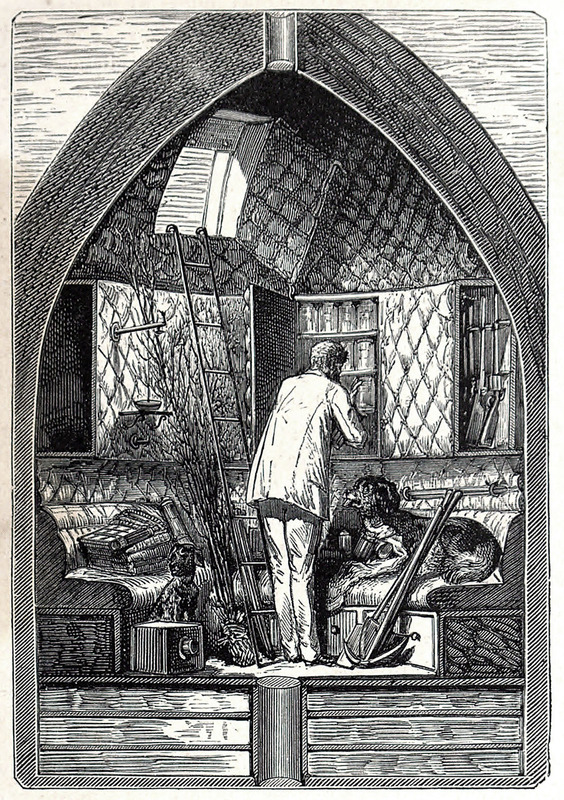 Is there another option, more in the style of Jules Verne? 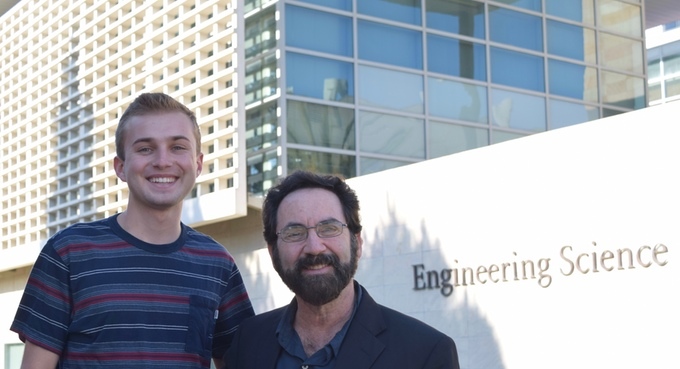 One year ago Travis Brashears, a graduate student at the University of Santa Barbara in California, and his supervisor, Philip Lubin, professor of astrophysics and cosmology at the same university, published a paper Directed Energy Interstellar Propulsion of WaferSats in which powerful lasers “shoot” miniature (~ 1 gram only!) 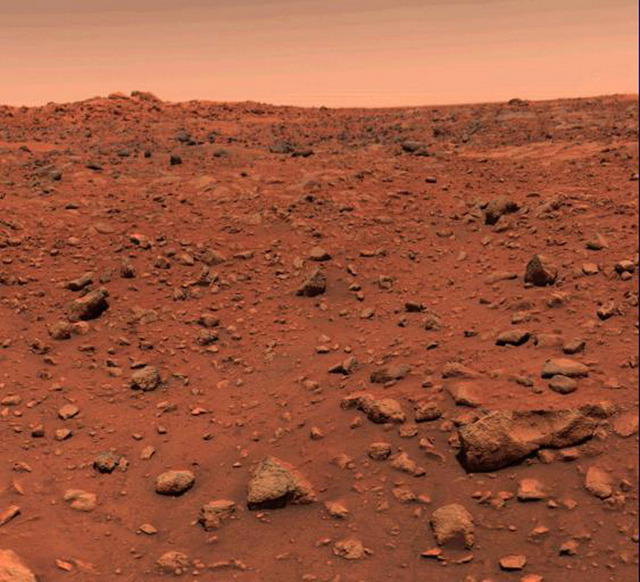 electronic chips away from earth in the direction of a nearby star, with a speed approaching the speed of light! Here are the (main) writers , Brashears left and Lubin right. Does this sound as science fiction? For me it does. But apparently not for these guys. Sure, light exerts pressure, there are several projects going on, using sunlight propelling a solar sail , a bit similar to the sail of a sailing boat being blown by the wind. 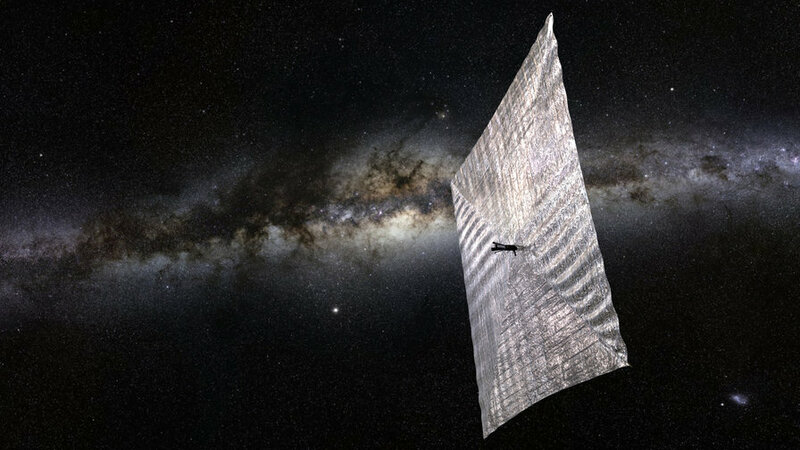 One successful project is IKAROS, a solar sail of 196 m2 (!) , launched in 2010 by Japan. 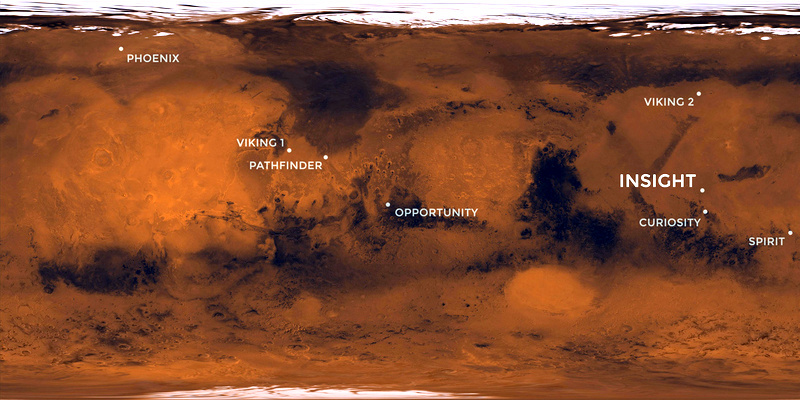 Here an artist impression of the sail, with Venus, its destination. The sail is so big. because the thrust of the sunlight is only small. 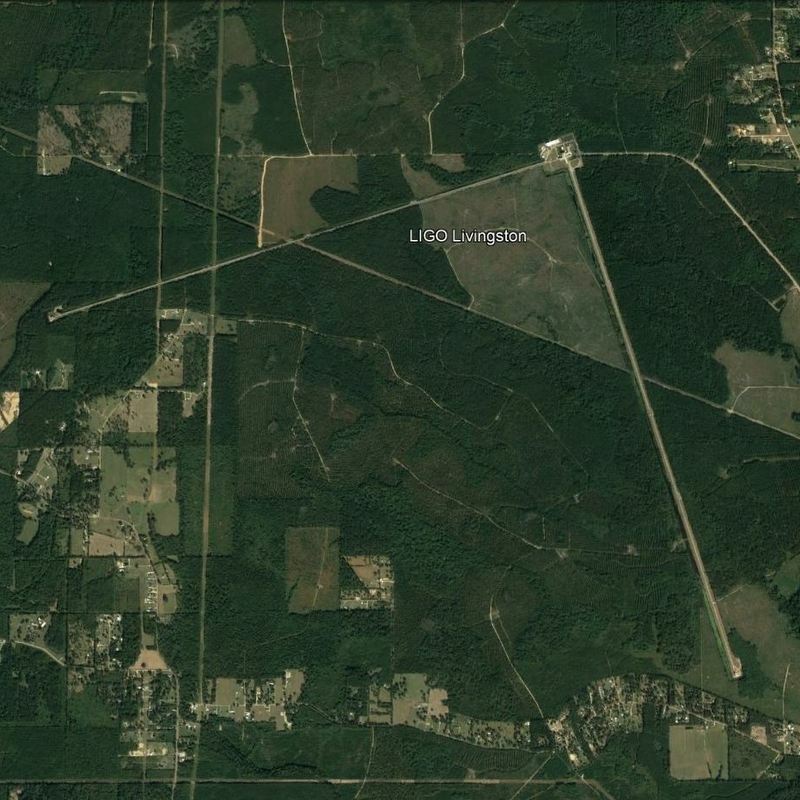 Next year March the LightSail 2 will be launched. To the left the actual spacecraft, a so-called cubesat. 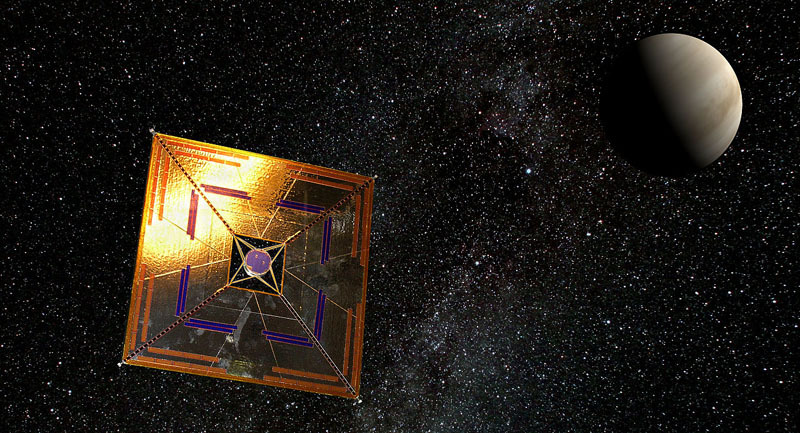 To the right an artist impression of the LightSail in space, with a deployed sail. 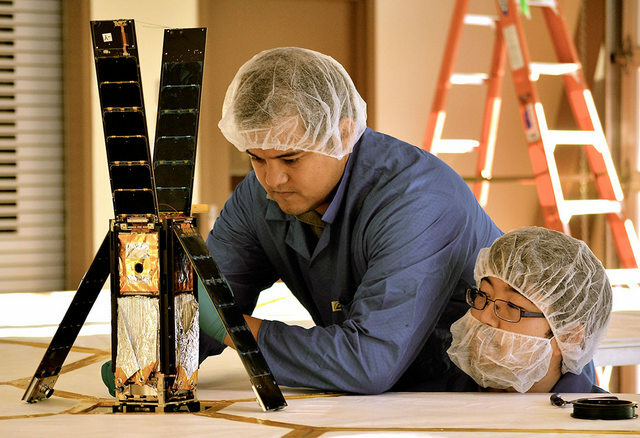 Notice how small the cubesat is compared to the sail! These projects are using sunlight. The project of Brashears and Lubin is futuristiic. 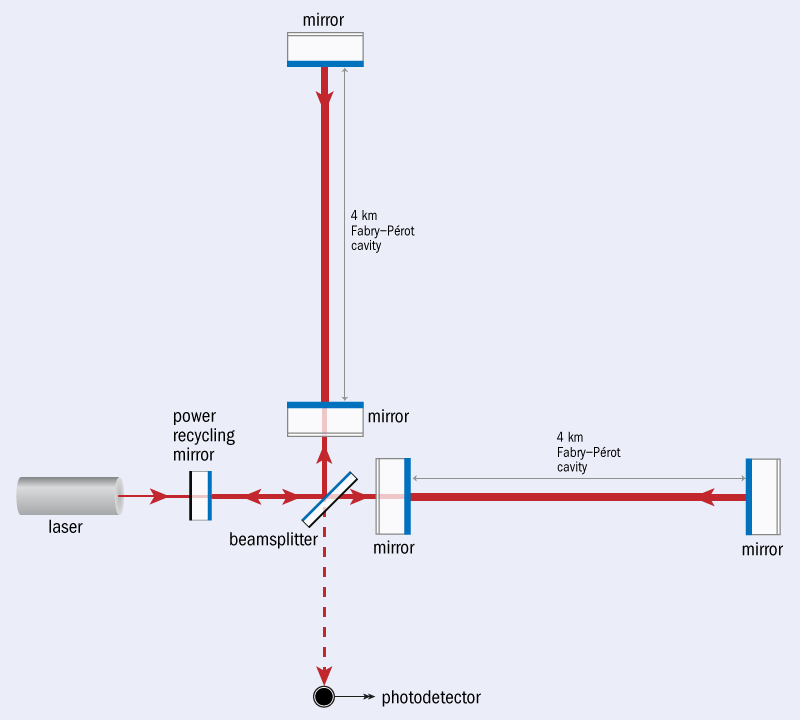 A ground-based laser will be used as a “shotgun” Estimated power needed 100 GW. That is a lot! The Three Gorges Dam in China, the largest power plant in the world, generates 22.5 GW. 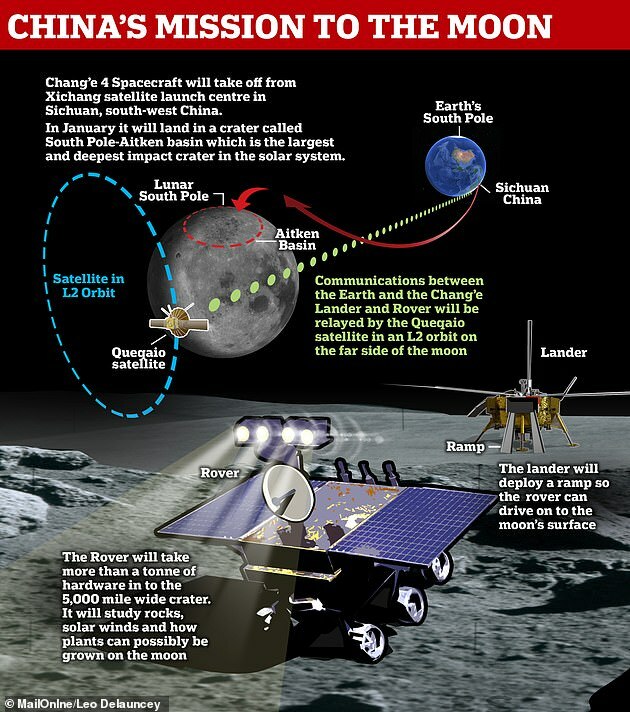 The spacecraft will be a chip with a mass of about 1 gram, with a light sail of ~ 1 m2 . The plan is to prepare about 1000 of these miniature “spacechips” and launch them simultaneously in a mothership, orbiting the earth. From there the starchips will be shot, one after another on a daily basis, during 3 year. The spacechips will reach Proxima b in about 20 year. Hopefully at least a few of them will have survived the journey. They will send back pictures to earth. 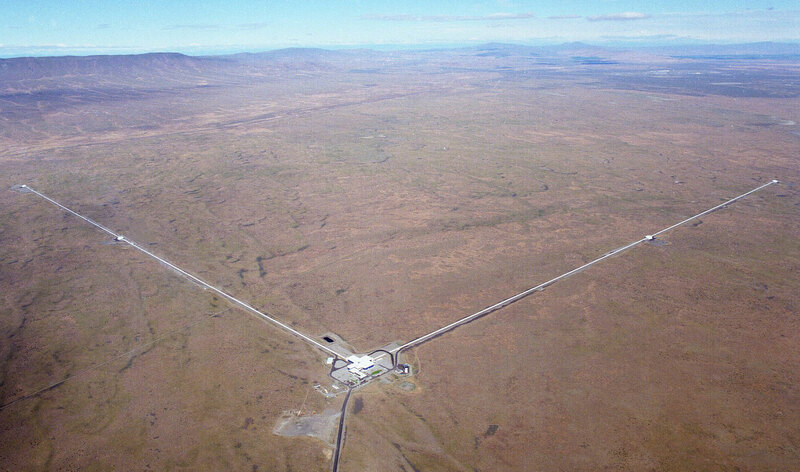 Estimated cost of the project US$ 5-10 billion. Proposed launch date about 20-30 years from now. Here is an artist impression of the launch. 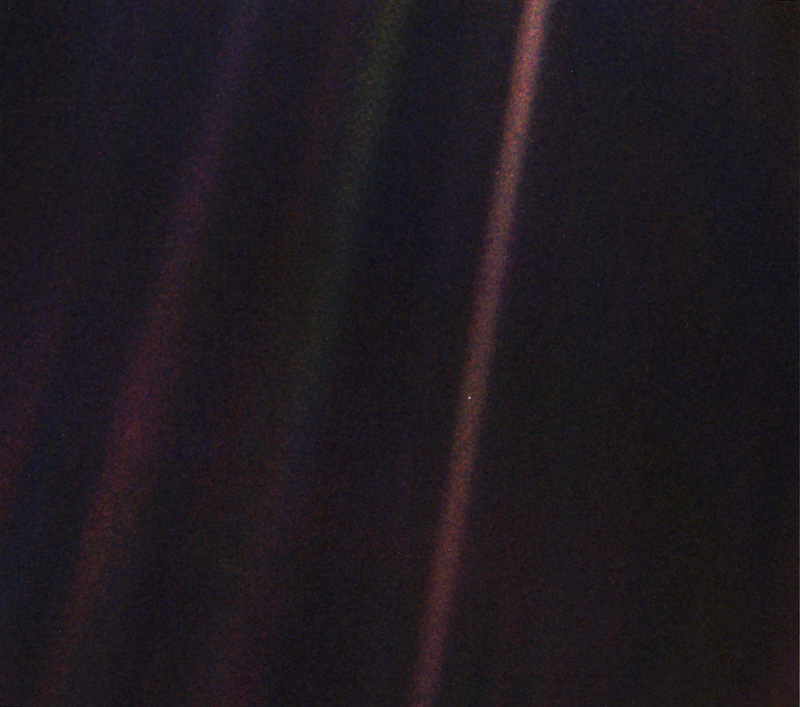 Mind you, the spacechip is the tiny dot in the center of the light sail! Futuristic indeed. The time span of 20-30 year is because much of the technology still has to be developed. 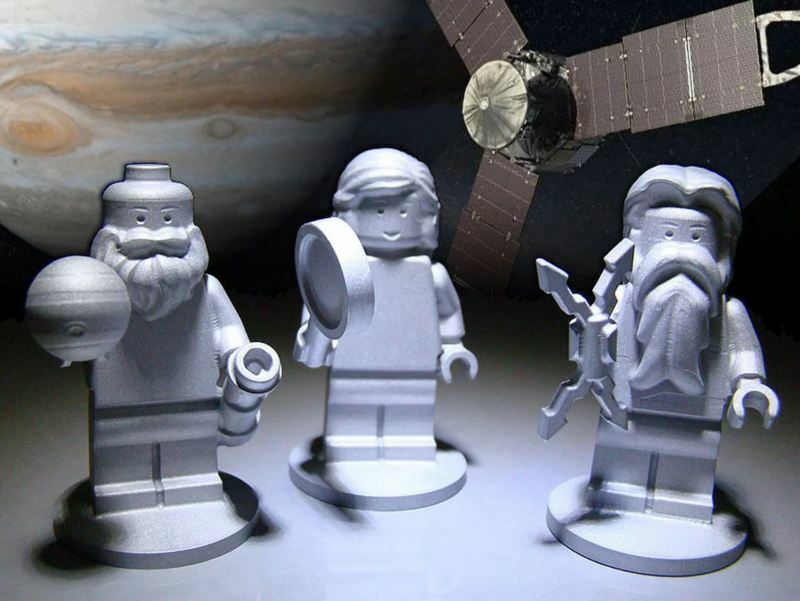 Designing a spacecraft on a centimeter-size, gram-scale chip, developing a light sail with a thickness of 1 micron or less, building a 100 GW laser and many more challenges. Here another artist impression. 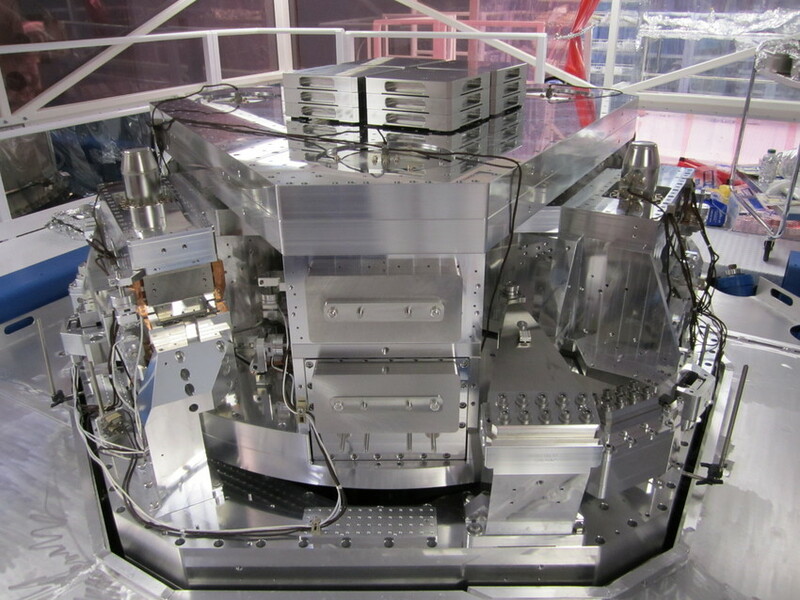 The plan is to build a so-called “phased” array of smaller lasers, with a combined power of 100 GW. If you use 100 kW lasers ( at the moment the maximum power available), you need a staggering 1 million of them. I am skeptic, as usual…:-) But not everybody is. Yuri Milner, for example is optimistic. This Russian/American tech entrepreneur and multi-billionaire, started as a physicist and is very interested in the big question “Are we alone in the universe“. 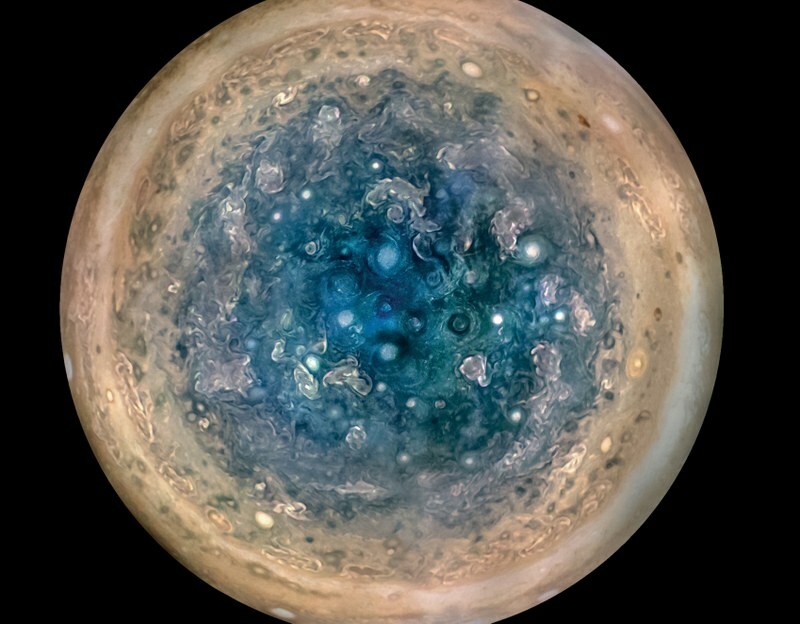 In July 2015 he announced, together with the British physicist Stephen Hawking, the Breakthrough Initiatives , a program to search for extraterrestrial intelligence. At that time the program consisted of two parts. Breakthrough Listen. 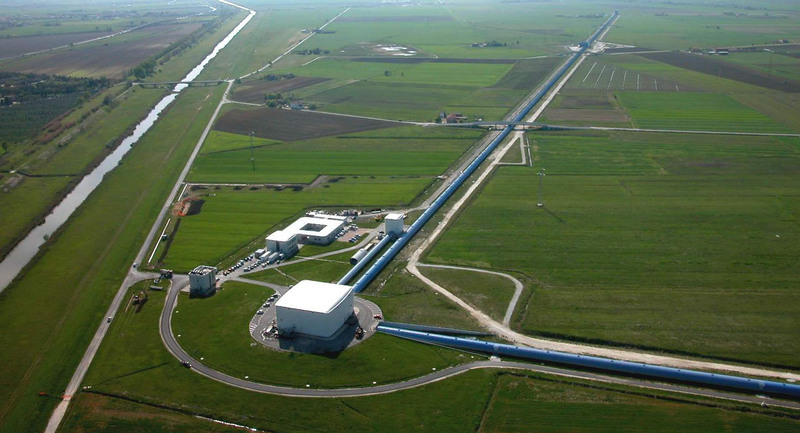 Basically a large-scale version of the SETI project. Funded by Milner with US$100 million. Breakthrough Message. 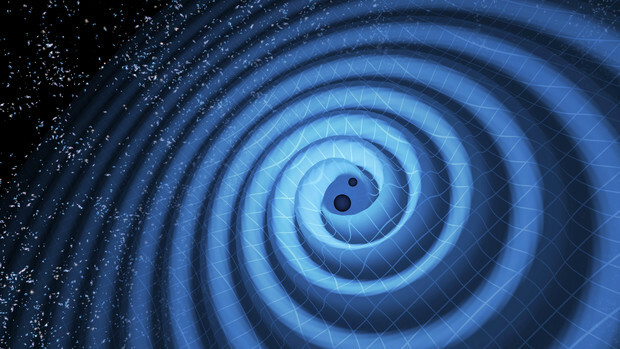 A prize pool of 1 US$ 1 million for the best (digital) messages that could be sent out into deep space. No concrete plan to actually send these messages, because for example Hawking thinks it might not be advisable to do that. See my blog Anybody Out There? 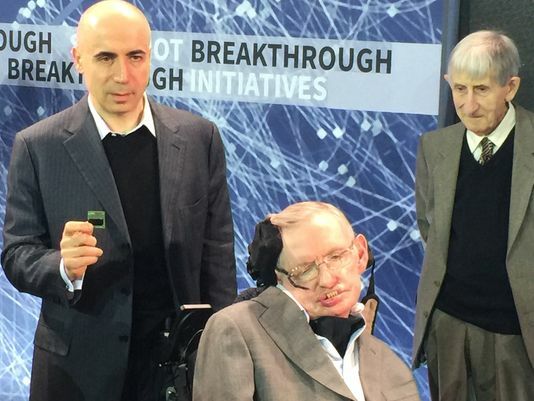 In April 2016, part 3, Breakthrough Starshot, was announced by Milner and Hawking. Milner and Mark Zuckerberg (FaceBook) will contribute another US$ 100 million to explore the technological feasibility of the program outlined above. Below is an animation of the process. A few comments may be useful. 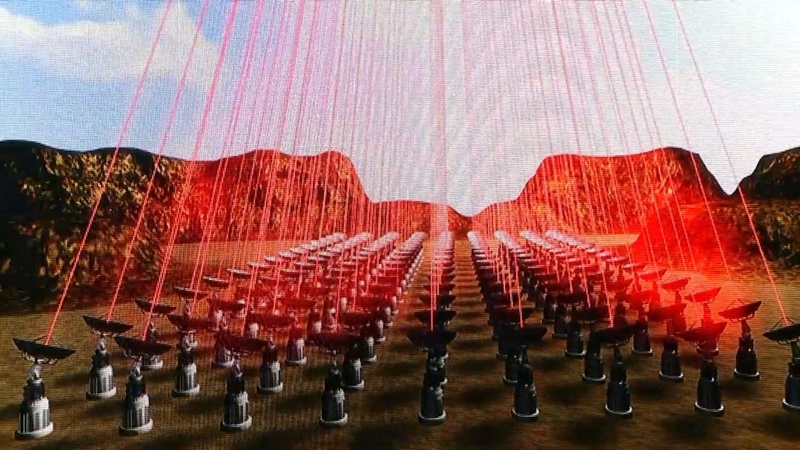 There are 135 lasers in the array. You need at least 1 million. 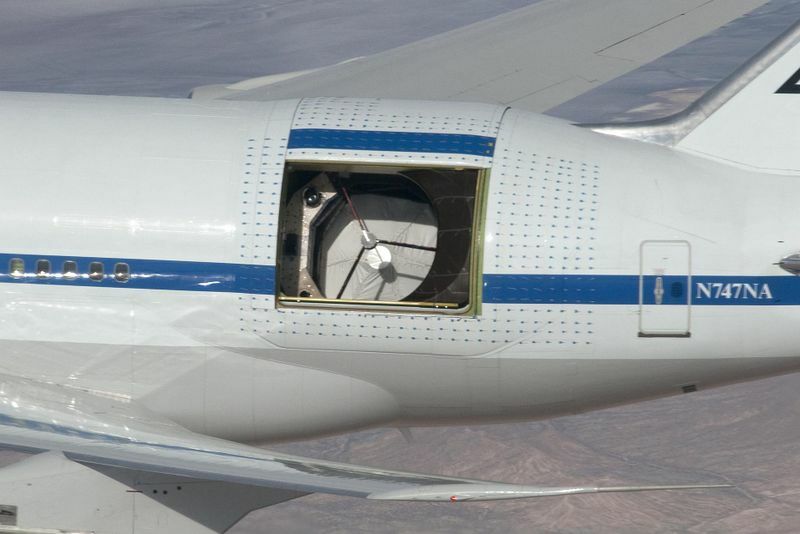 The spacechips are launched simultaneously in a container, but released and shot one after another. When they reach Proxima b after ~ 20 years, they will pass the planet at full speed (60.000 km/s). So fast that the camera on board can only take a few pictures. Also data will be collected about magnetic fields etc. 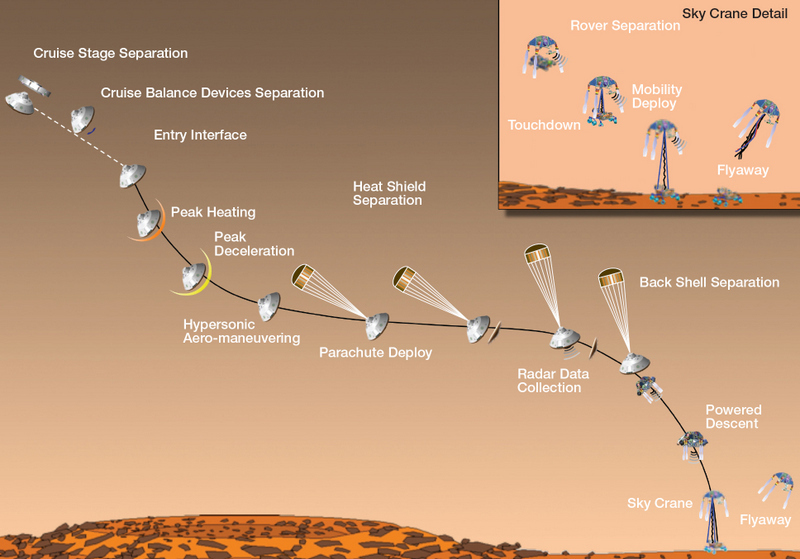 These data will be sent back to earth, using miniature lasers on the spacechip, focused with the help of the light-sail. I have been working about two weeks on this blog, reading and collecting as much information as I could find. To be honest, I became more and more skeptic. A few days ago Scientific American has published a very informative article about the Starshot Program: Inside the Breakthrough Starshot Mission to Alpha Centauri. Many scientists were asked for their opinion about the project. There is respect for the technological challenge, but scepsis about the scientific value.